Prof Mely Caballero-Anthony, Head of RSIS’ NTS Centre, and Mr Julius Cesar Trajano, Research Fellow at NTS Centre, delivered a presentation on nuclear governance in the Asia-Pacific and the role of Southeast Asia at the ASEAN Regional Forum (ARF) Inter-sessional Meeting on Non-proliferation and Disarmament (ARF ISM on NPD), held in Bali, Indonesia on 8-9 April 2019. 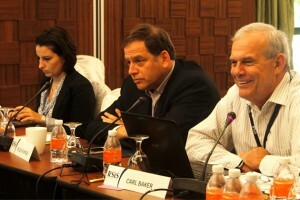 Their presentation was among the policy-oriented research contributions of CSCAP to the ARF ISM on NPD. The meeting served as a valuable multilateral platform among ARF member-states to share their assessments on peaceful uses of nuclear technology, regional and global non-proliferation issues, and disarmament. 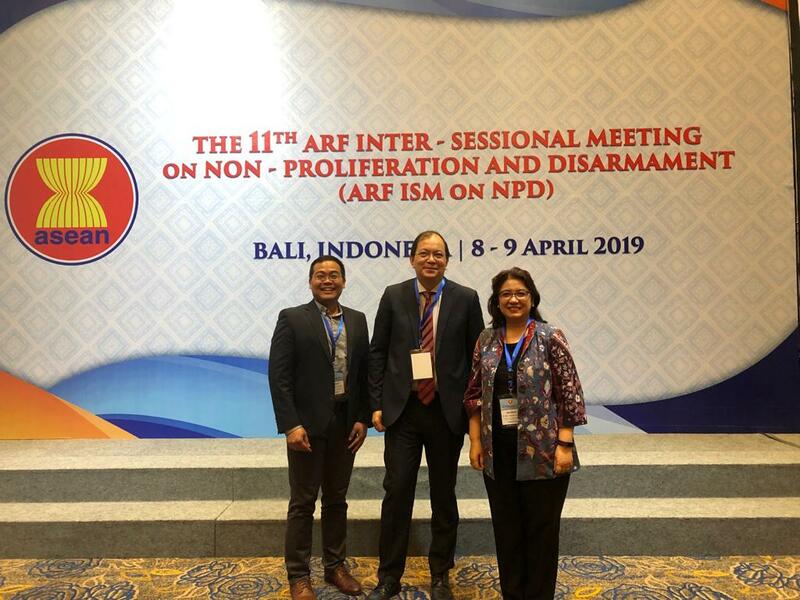 Prof Mely Caballero-Anthony, Head of RSIS’ NTS Centre, and Mr Julius Cesar Trajano, Research Fellow at NTS Centre, attended the Sixth Meeting of the Council for Security Cooperation in the Asia-Pacific (CSCAP) Study Group on Non-Proliferation and Disarmament, held in Bali, Indonesia on 7 April 2019. 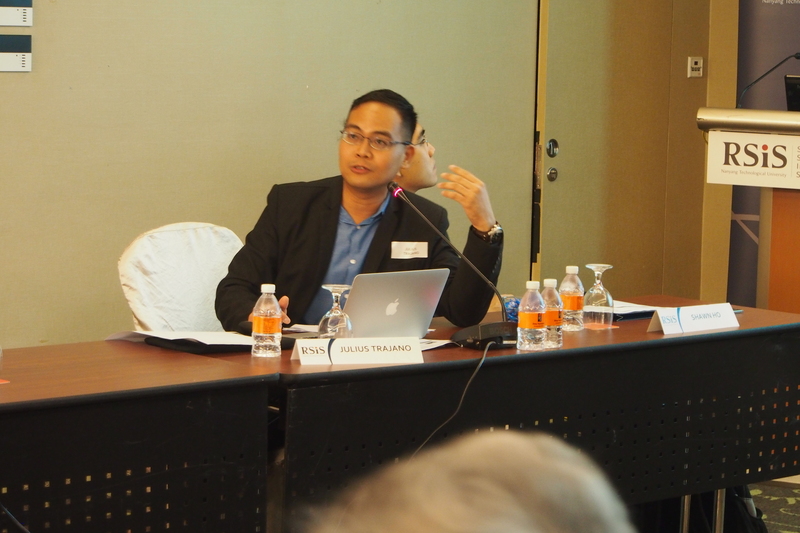 They delivered a presentation on nuclear governance in the Asia-Pacific and the role of Southeast Asia. 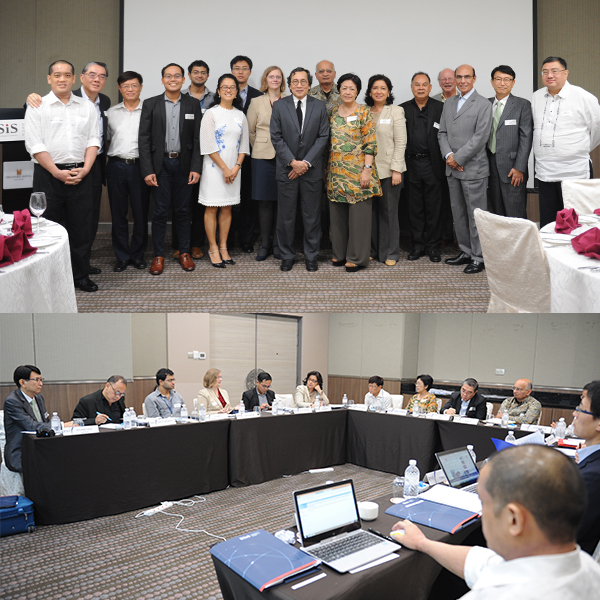 Around 45 senior scholars and officials from Asia-Pacific countries deliberated on recent developments in non-proliferation, denuclearisation of North Korea, nuclear safety and security governance in the Asia-Pacific, and the issue of nuclear disarmament. 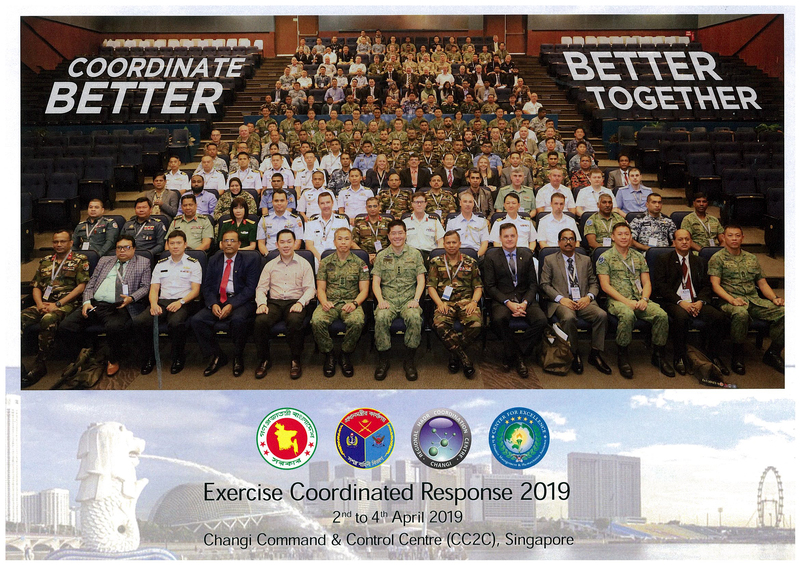 Exercise Coordinated Response (ExCoores) 2019, 2-4 April 2019: Excoores 2019 had the following objectives: (i) to demonstrate the Multi-National Coordination Centre (MNCC) concept of operations, (ii) exercise AFD MNCC in coordinating Assisting Militaries aid and relief efforts, and (iii) walk-through RHCC concept of operations in supporting the Affected State’s military MNCC. 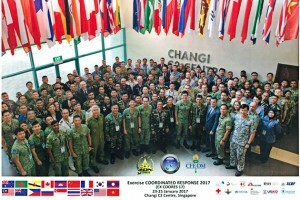 The RSIS Humanitarian Assistance and Disaster Relief (HADR) Programme team participated in ExCoores 2019, a biannual event that aims to enhance military-to-military coordination and interoperability during HADR operations in the areas of information-sharing and deployment and employment of foreign military assistance. This year’s exercise is co-organized by the Bangladesh Ministry of Disaster Management and Relief, Bangladesh Armed Forces Division (AFD), SAF Regional HADR Coordinating Centre, and the Centre for Excellence in Disaster Management and Humanitarian Assistance. Dr Alistair Cook and Mr Angelo Trias together with 18 non-government organizations participated in focus group discussions and observed 25 foreign militaries engage in table-top exercises at the Changi Command & Control Centre (CC2C) in Singapore. The exercise scenario involves foreign military assistance in response to a 7.8 magnitude earthquake in Dhaka. The keynote speaker at the 4th NTS-Asia Consortium Conference Ms. Adelina Kamal, the Executive Director of the ASEAN Coordinating Centre for Humanitarian Assistance on Disaster Management (AHA Centre), received a token of appreciation from RSIS Executive Deputy Chairman Amb. Ong Keng Yong. 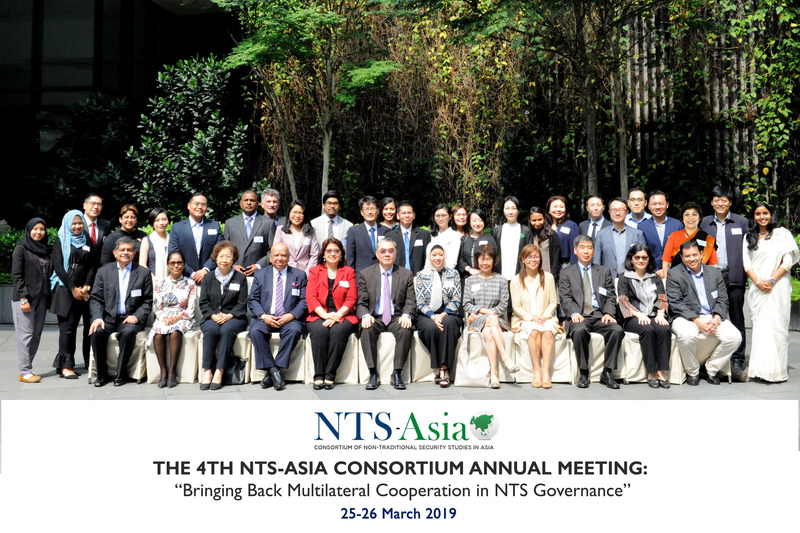 The 4th NTS-Asia Consortium Annual Meeting on “Bringing Back Multilateral Cooperation in NTS Governance” brought together 23 out of the 31 members of the NTS-Asia Consortium. It was held on 25-26 March 2019 in Singapore. 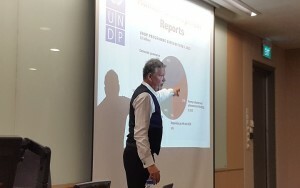 Dr Kamolvej gave two seminars titled “Glocalisation of Disaster Risk Reduction Frameworks: Implementing SENDAI and AADMER” and “Policy Instruments for Non-Structural Disaster Risk Reduction Measures: Building and Construction Safety in Thailand”. 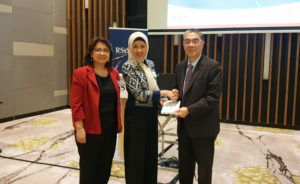 The first seminar on 13th March 2019 explored the mutually reinforcing components of the SENDAI Framework for Disaster Risk Reduction (SFDRR) and the ASEAN Agreement on Disaster Management and Emergency Response (AADMER), while the second seminar on 14th March 2019 focused on some of the non-structural disaster risk reduction measures currently being implemented in Thailand. Dr Kamolvej used to serve as Disaster and Emergency Management advisor to the National Disaster Warning Center, Thailand. 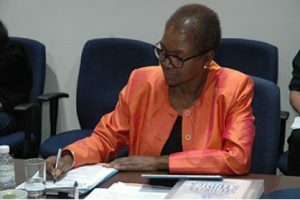 She also joined the sub-committee on Disaster and Risk Communication of the National Committee of Broadcasting, Televising, and Telecommunication, to develop national and local communication regulations and a framework for action. At the international level, Dr. Kamolvej used to be communication and coordination instructor for the US State Department Senior Crisis Management Seminar Program in collaboration with American University, Washington DC, USA, and also represented Thailand in the Technical Expert Team to develop indicators and methodology for the Sendai Framework for Disaster Risk Reduction with UNISDR. 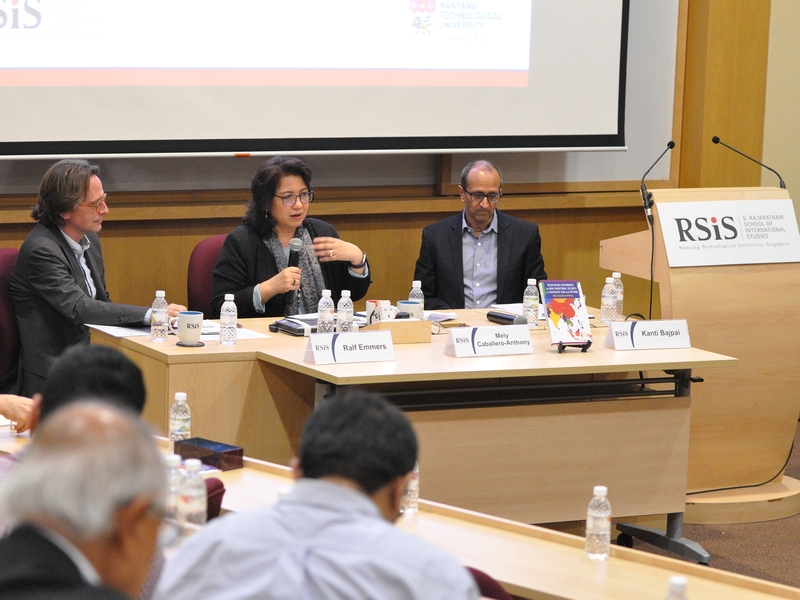 RSIS organised a book launch seminar on Negotiating Governance on Non-Traditional Security in Southeast Asia and Beyond, authored by Dr Mely Caballero-Anthony, Professor of International Relations and Head of the RSIS Centre for Non-Traditional Security (NTS) Studies. Around 50 people attended the seminar, held at [email protected] North on 6 March. Ambassador Ong Keng Yong, Executive Deputy Chairman of RSIS, congratulated Prof Caballero-Anthony for writing an excellent book that would further advance the concept of non-traditional security in both academic and policy studies. 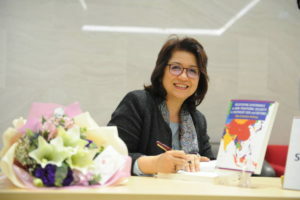 In delivering her summary of the book, Prof Caballero-Anthony argued that in a region that is often described as zealous in protecting state sovereignty, security governance of NTS issues does exist, bringing together state and non-state actors who can set the security agenda, provide resources, push for observance of certain norms, and seek collaborative policy approaches. Nepal Fieldwork: 18-22 February. 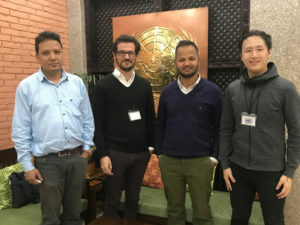 The S. Rajaratnam School of International Studies’ Humanitarian Assistance and Disaster Relief (HADR) research team travelled to Kathmandu, Nepal to understand whether technology used during the 2015 Nepal earthquake had a longer term impact on the local population , and whether emerging technologies in humanitarian action can facilitate both the centralisation and decentralisation of disaster management. 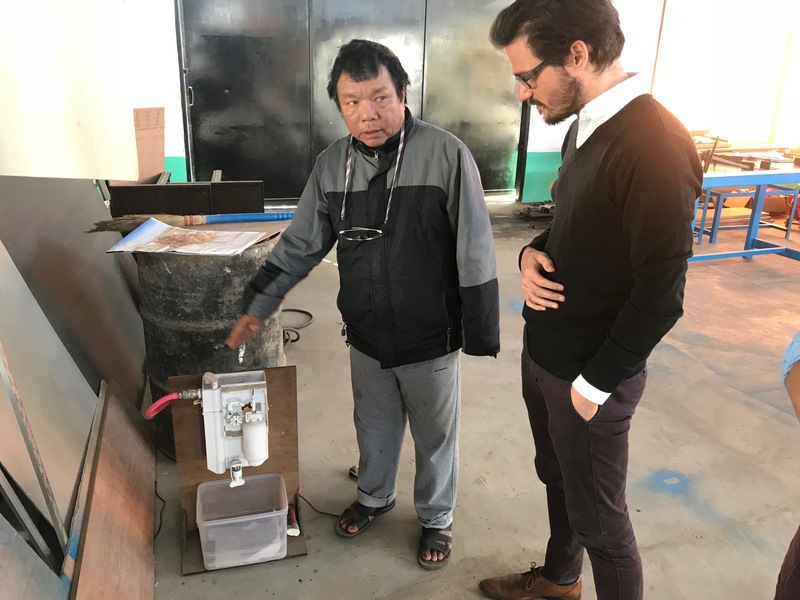 Mr Martin Stanley Searle and Mr Christopher Chen met with stakeholders from INGOs, government bodies, international and local innovation labs to discuss these two areas of research. 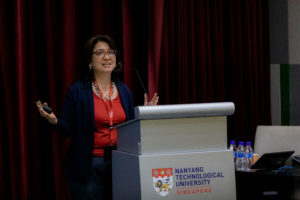 Head of RSIS Centre for NTS Studies, Prof Mely Caballero-Anthony, speaking at the Workshop on ‘Unpacking Industry 4.0’, organised by NTU’s College of Humanities and Social Sciences on 8 February 2019. 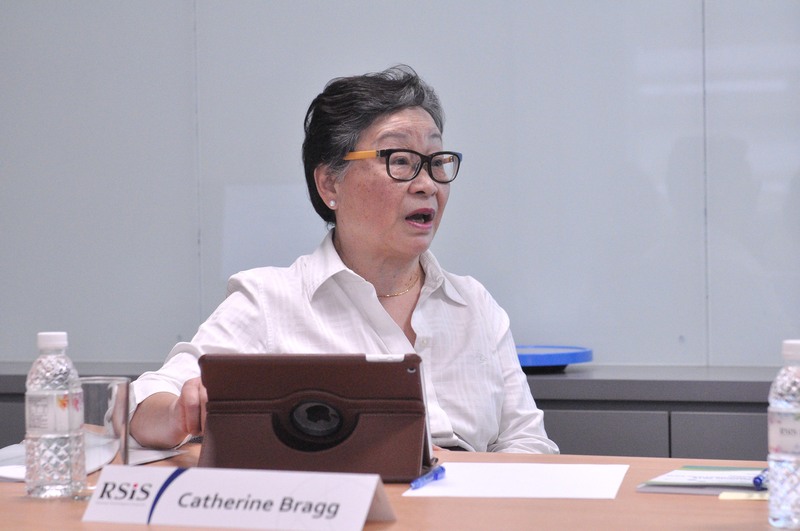 RSIS Seminars on the International Humanitarian System delivered by Dr Catherine Bragg, Visiting Senior Fellow, RSIS, NTU, Singapore; Adjunct Full Professor, Centre for Humanitarian Action, University College Dublin; and Governor of the University of Toronto, Canada. Dr Bragg is a former Assistant Secretary-General for Humanitarian Affairs and Deputy Emergency Relief Coordinator in the United Nations (2008-2013). As the ASG, she was the deputy head of the Office for the Coordination of Humanitarian Affairs (OCHA). 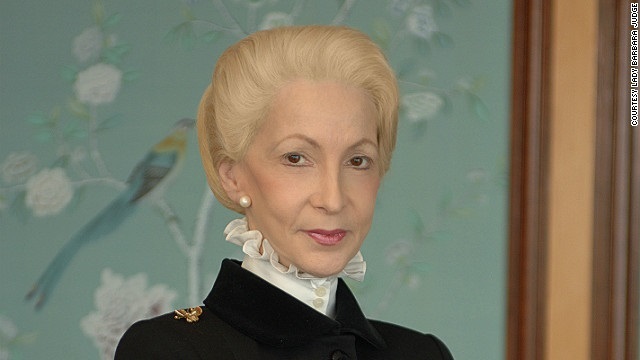 Prior to her secondment to the UN, she spent 24 years in the federal public service of Canada. In total, she has visited over 100 countries and been involved in response to close to 30 humanitarian crises and situations. The first seminar on the 19th February 2019 assessed the development of the international humanitarian system over the last thirty years and the second seminar on the 21st February 2019 focused on the need to re-orient the international humanitarian system drawing on Dr Bragg’s experience in the field. Complex Humanitarian Emergencies & Disaster Management in Bangladesh Research Findings Seminar, 27 January 2019, Centre for Peace and Justice, BRAC University, Dhaka: Dr Alistair D. B. Cook delivered his team’s research findings from their trip to Bangladesh in early 2018. Professor Mohammad Tamim, Pro-Vice Chancellor, BRAC University chaired and delivered the concluding remarks in the lecture. Regional Consultative Group on Humanitarian Civil-Military Coordination, Dhaka, 24 – 26th January 2019: Dr Alistair D. B. Cook, Coordinator of HADR Programme and Research Fellow, NTS Centre, participated in the Fourth Session of the Regional Consultative Group on Humanitarian Civil-Military Coordination at the Intercontinental Hotel Dhaka, Bangladesh. 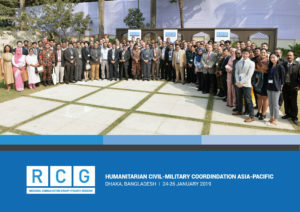 The Fourth Session included highlights from country work plans; working groups on logistics and information sharing; standardisation: EMT and INSARAG; insight into an earthquake in an urban setting; thematic groups on assessment processes, coordination, and standards; recommended practices for foreign military assets in natural disaster response; and publication review of updating RCG reference materials. The Fourth Session concluded with the RCG 2019 Vision and Handover from Bangladesh as outgoing RCG 2018 Chair to Thailand as incoming RCG 2019 Chair. 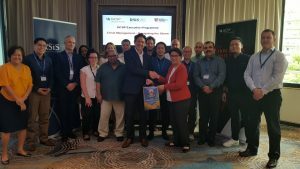 The NTS Centre, CSCAP Singapore and the Pacific Forum jointly convened the annual meeting of the CSCAP-Nuclear Energy Experts Group (NEEG) held on 24-25 January 2019. 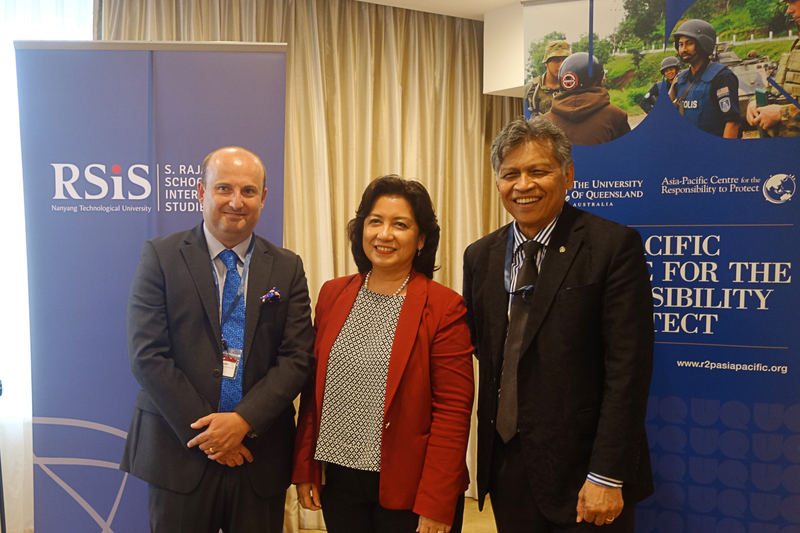 Prof Mely Caballero-Anthony, Head of NTS Centre, and Mr Julius Cesar Trajano, Research Fellow at NTS Centre, delivered a joint presentation on building nuclear governance in the Asia-Pacific and the pivotal role of Southeast Asia. 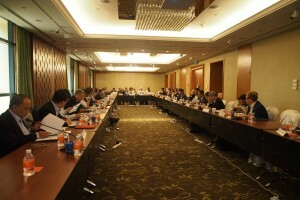 About 40 nuclear experts and officials from Asia-Pacific countries attended the meeting. The discussions focused on global nuclear governance, strengthening nuclear governance in the Asia Pacific, the nuclear-export regime, and the impact of new technologies on nuclear governance. The NTS Centre organised a seminar on “Denuclearisation of North Korea: What Can be Learned from South Africa, Libya, Iraq and Iran” on 12 December 2018. Dr Olli Heinonen, Senior Advisor on Science and Nonproliferation at the Foundation for Defense of Democracies, discussed the tedious process of denuclearisation as well as the requirements for the complete denuclearisation of North Korea. Dr Heinonen also shared his first-hand information on previous attempts to denuclearise North Korea and lessons learned from verification approaches in Iran, Libya, Iraq and South Africa. The NTS Centre organised a roundtable on “Nuclear Energy Development in Southeast Asia: Emerging Challenges and Opportunities” on 11 December 2018. 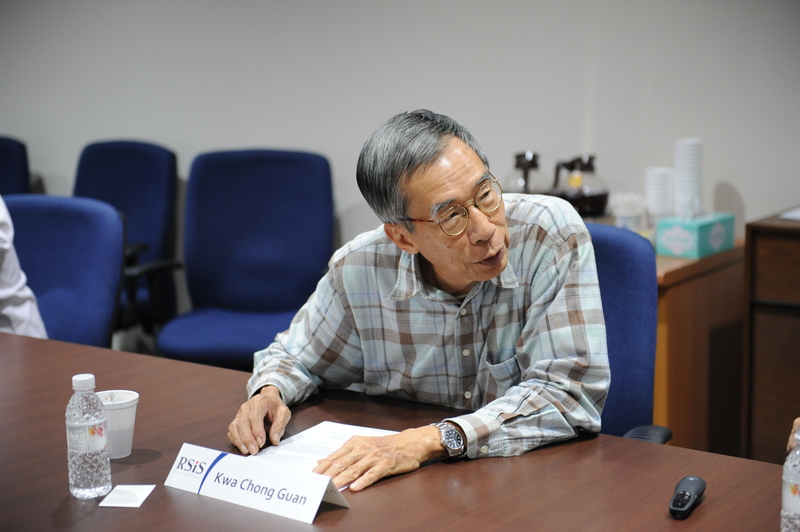 Six nuclear experts from Southeast Asia, Japan, South Korea and the United States delivered presentations on nuclear energy plans in Southeast Asia, key contributions of nuclear science to dealing with climate change and other non-traditional security challenges, governance of radioactive materials, regional nuclear security cooperation, emerging nuclear safety-security issues in the region, and relevant lessons from Japan and South Korea. 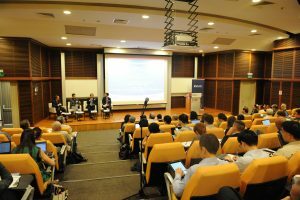 Around 100 participants from government agencies, NTU, NUS, research institutes, and the private sector attended the roundtable. 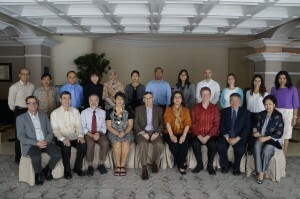 Singapore Humanitarian Network and Research Meeting, 6 December. 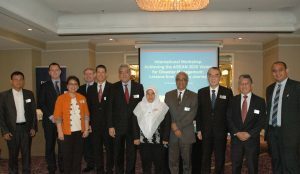 The Humanitarian Assistance and Disaster Relief Programme hosted the third Singapore Humanitarian Network and Research Meeting. 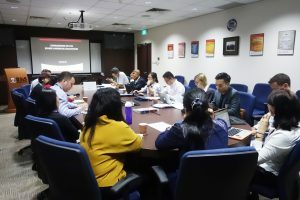 Twenty-two researchers from different disciplines and universities in Singapore came together to discuss transdisciplinary research collaboration in humanitarian affairs. 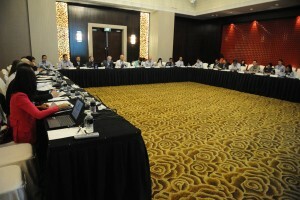 The participants resolved to formalise the network and established three working groups: education, logistics and data. 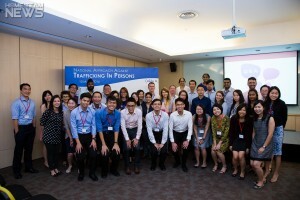 The Singapore Humanitarian Network will meet twice a year going forward. The NTS Centre organised a seminar on “Science and Technology Needs in Nuclear Security Detection” on 20 November 2018. Dr Charles Massey, a nuclear security officer of the International Atomic Energy Agency, delivered the seminar. 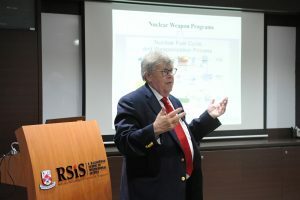 Dr Massey discussed the innovative use of science and technology to address the ever-evolving challenges in nuclear security around the world. He also highlighted how various disciplines, such as natural sciences, engineering, finance, and social sciences, can contribute to meeting the growing science and technology needs in nuclear security. 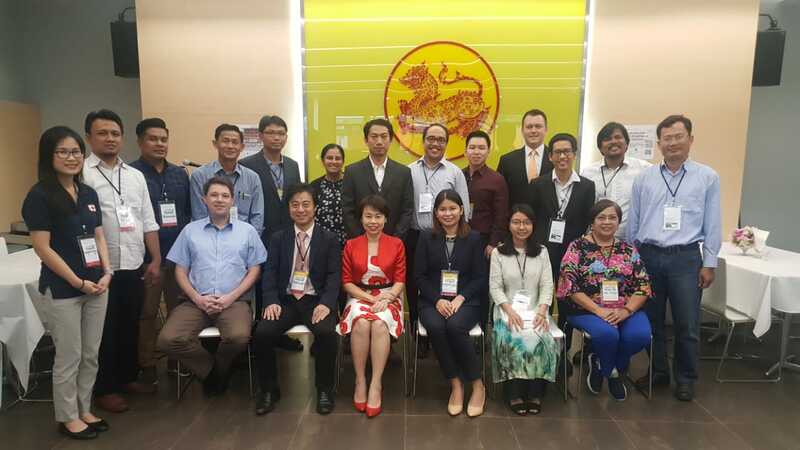 Around 45 participants from Nanyang Technological University, National University of Singapore, government agencies, and the private sector attended this seminar. Mr Julius Trajano attended the ASEAN Regional Mine Action Centre (ARMAC) Regional Workshop 2018 held from 12 to 14 Nov 2018 in Siem Reap, Cambodia. Mr Trajano delivered a presentation on complex humanitarian crises involving disasters, conflicts and landmines in Southeast Asia. 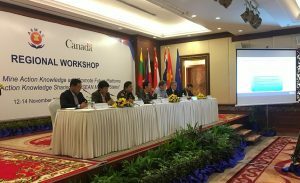 Jointly organised by ARMAC and the Government of Canada, the regional workshop tackled proposals to enhance regional capacity and cooperation so as to effectively address the issue of mines/explosive remnants of war in the Southeast Asian region. It brought together representatives of ASEAN Member States, Donor Countries, mine action organisations, the ASEAN Secretariat and selected ASEAN academic institutions. The keynote address, delivered by Dr. 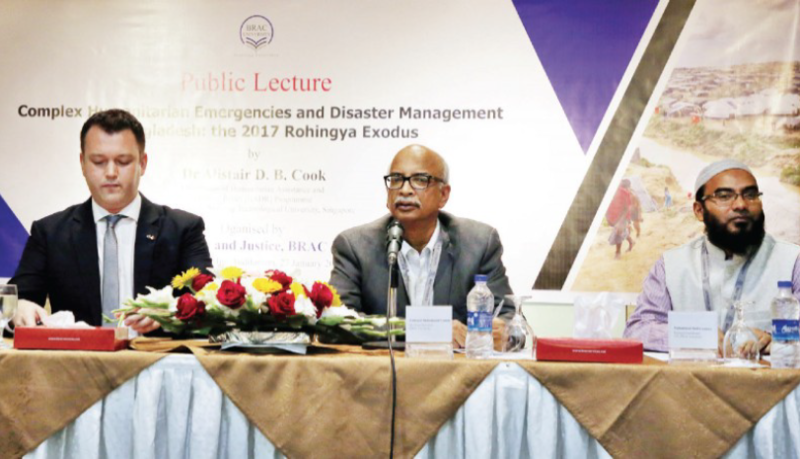 Win Myat Aye, Union Minister for Ministry of Social Welfare, Relief and Resettlement, highlighted Myanmar’s progress in disaster preparedness in legal frameworks, institutional arrangements, mitigation measures, capacity building, hazard monitoring and early warning systems. A subsequent public roundtable on practitioner reflections by Dr. Noeleen Heyzer, Mr. Robert H.K. Chua, and Mr. Ye Htut emphasized the importance of (i) adopting people-centred approaches (ii) building trust before attempting to offer assistance, and (iii) forging multi-stakeholder efforts including civil-military relations. The public event was attended by over sixty people. Head of NTS Centre attends the Expert Group Meeting on Climate and Security in New York, USA from 29-31 October 2018. 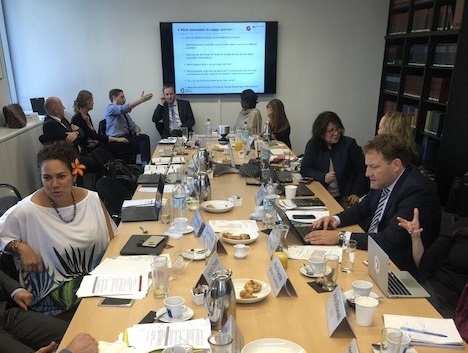 The Expert Group aims to analyse and examine the climate-related security risks around the world and their impact on international peace and security. 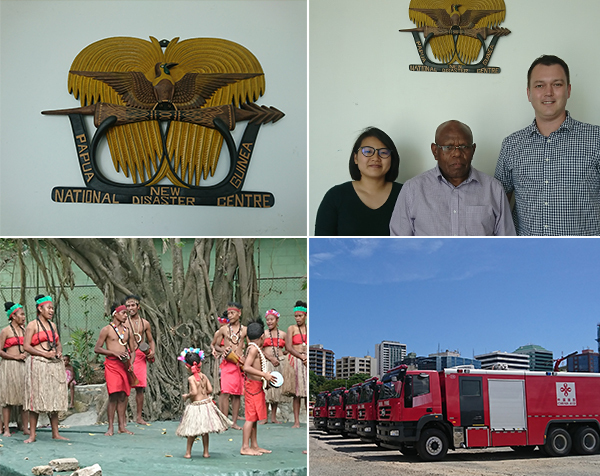 Papua New Guinea Fieldwork – From 20-27 October 2018, the S. Rajaratnam School of International Studies’ Humanitarian Assistance and Disaster Relief (HADR) programme travelled to Port Moresby, Papua New Guinea to conduct fieldwork. 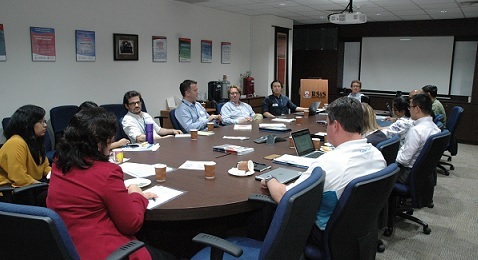 During the visit, Dr Alistair Cook and Ms Foo Yen Ne met with disaster management and humanitarian actors in Papua New Guinea, including the National Disaster Centre, Emergency Controller’s Office, UN agencies and non-governmental organisations to understand the humanitarian context as well as the disaster management challenges faced by the country. 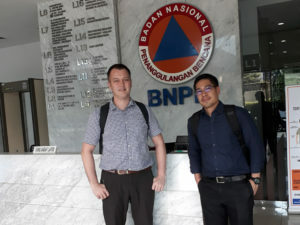 Data gathered from the fieldwork will help inform the HADR programme’s research into opportunities for collaboration between Southeast Asia and Papua New Guinea in the disaster management space. From 15th October to 19th October 2018, the S. Rajaratnam School of International Studies and the Geneva Centre for Security Policy (GCSP) co-hosted a crisis management course on how to lead effectively in a turbulent and fast-moving world. Co-organised by Mr David Horobin from GCSP and Dr Alistair Cook, Research Fellow and Coordinator of the Humanitarian Assistance and Disaster Relief (HADR) Programme, the course sought to educate policymakers and executives to think and act more creatively in times of crisis, and to develop the skills and knowledge required to navigate through them. Over the course of five days, participants – which included Mr Angelo Trias and Mr Christopher Chen from the NTS Centre – learnt to recognise and adapt the psychological and organisational elements of crisis management. They also participated in real-time simulations that enabled them to put into practice the various theoretical concepts taught during the course. 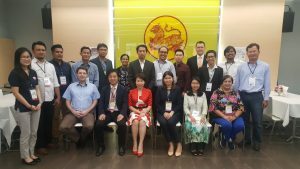 The 2018 Southeast Asia Disaster Risk Governance Academic Seminar, 24-26 September 2018, Bangkok, Thailand, was co-organised by ASEAN, Thammasat University and the International Federation of Red Cross and Red Crescent movement (IFRC) as an ASEAN-Canada project funded by the Government of Canada. 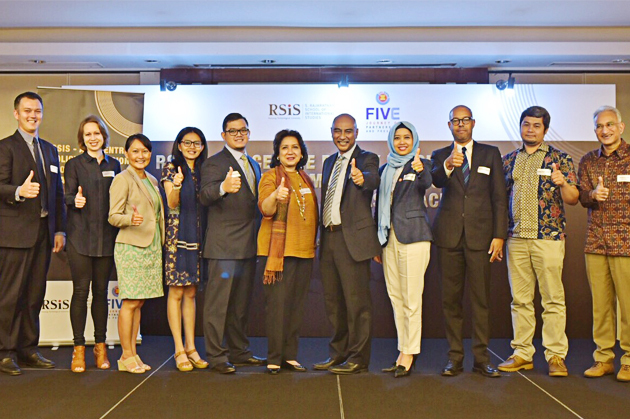 The seminar was partnered with the S. Rajaratnam School of International Studies (RSIS), Asian Institute of Management, Ateneo de Manila University, Canadian Red Cross, Chulalongkorn University, Institute of Technology Bandung (ITB), and the Resilience Development Initiative. 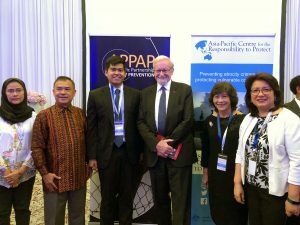 Alistair D. B. Cook served as a paper discussant and explored with the co-organisers and partners the establishment of a Disaster Law and Policy Platform for greater collaboration between academics, practitioners and policy-makers on disaster governance in Southeast Asia. Air Commodore Bill Boothby (Retd) Associate Fellow, Geneva Centre for Security Policy delivered a lecture titled ‘Cyber Operations in War and Peacetime – Fundamental Issues and Critical Reflections’ on 6 September. He discussed the development of international law to govern States’ cyber activity and exposed the complexities of regulating such a contested space. 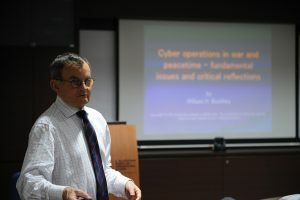 While there is wide disagreement in the international community on which rules apply on cyber activity, Air Commodore Boothby assessed the Tallinn Manual process, reports issued by the UN General Assembly-mandated Groups of Governmental Experts as well as an initiative from Russia and China to develop a Code of Conduct as a collection of ‘soft laws’ that can guide States’ behaviour. 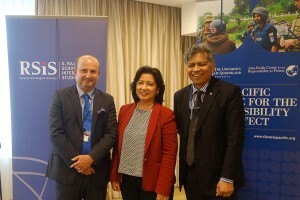 The S. Rajaratnam School of International Studies, through Associate Research Fellows, Margareth Sembiring and Jose Ma. Luis Montesclaros, participated in an evaluation of Climate Change Adaptation Road Maps made by government officials of Cambodia, Lao PDR, Myanmar and Viet Nam, last 30-31 August, in Siem Reap, focusing on addressing distributional impacts of disasters and climate change. This serves as a step towards becoming better prepared and more resilient, regionally, against potential threats to food security. The road maps are the culmination of efforts by the participants who have met and participated in four previous workshops on this issue. It included panel discussions on how the Road Maps could be implemented, with feedback from RSIS as well as other Knowledge Partners (see photo above), including the United States Department of Agriculture, International Food Policy Research Institute, the Asian Institute of Technology, the University of Technology, Vienna, Smart Farm Agriculture Center, Korea, and the National University of Singapore. Staff of the NTS Centre participated in the 5th bi-annual International Humanitarian Studies Association (IHSA) Conference from 27th to 29th August 2018 in The Hague, The Netherlands. 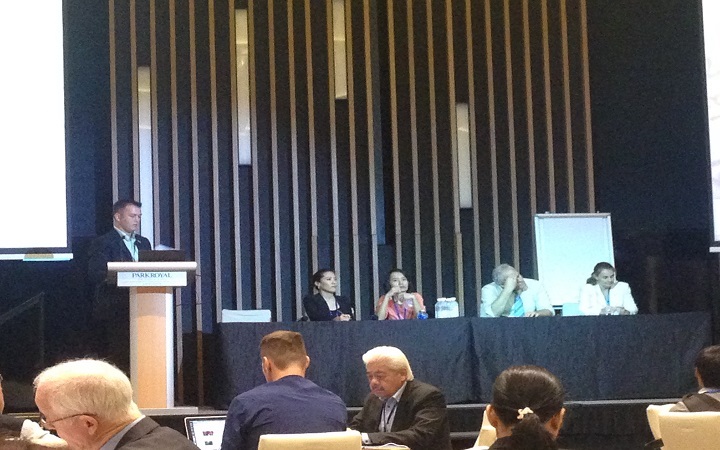 Dr Alistair Cook, Research Fellow and Coordinator of the Humanitarian Assistance and Disaster Relief (HADR) Programme, presented a paper on the development of new mechanisms in Southeast Asia, and their role in the negotiating of humanitarian access in conflict and disaster situations. Mr Christopher Chen, Research Associate, presented a paper on knowledge management for humanitarian continuity, examining the role of knowledge management in HADR operations in the Asia-Pacific region. Both papers were well-received and garnered significant interest from practitioners and academics alike. 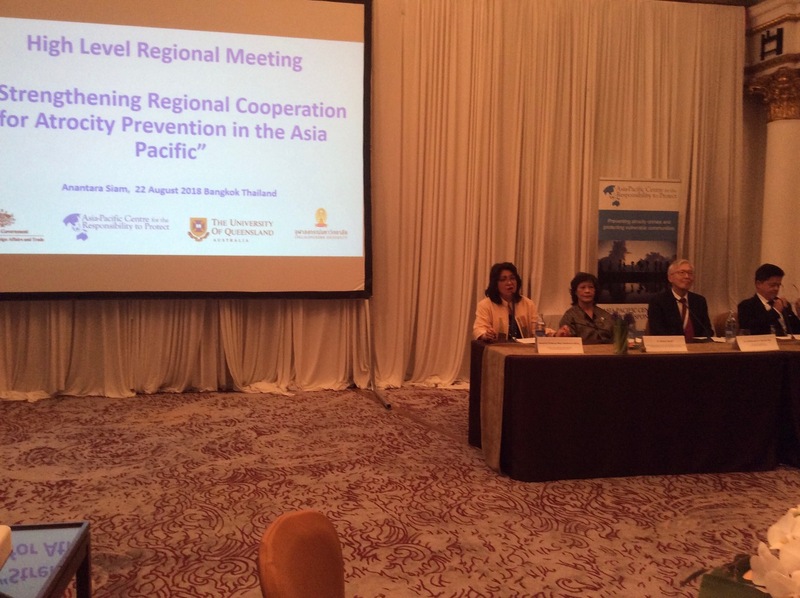 Head of NTS Studies Prof Mely Caballero speaking on regional efforts on preventing atrocities in Asia at the High Level Regional Meeting on Strengthening Regional Co-operation for Atrocity Prevention in the Asia Pacific, Bangkok, Thailand, 23 August 2018. 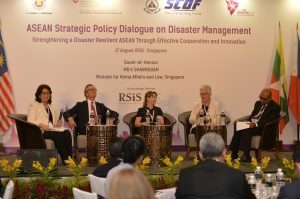 The ASEAN Strategic Policy Dialogue on Disaster Management (SPDDM) is co-organised by the Singapore Civil Defence Force (SCDF), ASEAN Secretariat and the ASEAN Coordinating Centre for Humanitarian Assistance on disaster management (AHA Centre) and was held on 17 August in Singapore, to mark World Humanitarian Day. The Humanitarian Assistance and Disaster Relief Programme of the NTS Centre, S. Rajaratnam School of International Studies (RSIS) served as the 2018 SPDDM knowledge partner for its theme “Strengthening a Disaster Resilient ASEAN through effective cooperation and innovation.” The dialogue focused on strengthening resilience by enhancing cross-sectoral bodies and multi-stakeholder cooperation; and cultivating innovation to enhance ASEAN’s disaster management capabilities. The Humanitarian Assistance and Disaster Relief Programme at the NTS Centre, S. Rajaratnam School of International Studies, in partnership with the Pacific Disaster Center (PDC-Global) and ASEAN convened a workshop to share ASEAN’s experience, architecture, and mechanisms which aimed to contribute to increasing HADR capacities while also exploring HADR’s broader linkages to disaster risk reduction and resilience building efforts more generally. 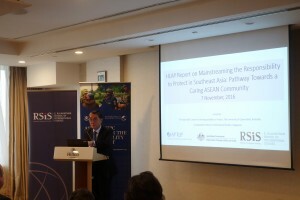 While the various components of ASEAN’s HADR architecture have been tested in numerous disasters, there is a need to better understand and analyze how well they have fared relative to the expectations generated by their creation; what were the main challenges and how well they were overcome; how do the different pieces of this architecture work together and interact with national- and local-level HADR platforms; and how well or which partnerships helped fuel this regional initiative. This workshop shone a bright analytic spotlight on these questions to generate valuable insights regarding ASEAN’s past performance, what steps it might take to address future challenges, and the emulative value of its track-record for HADR capacity-building innovations in other regions. 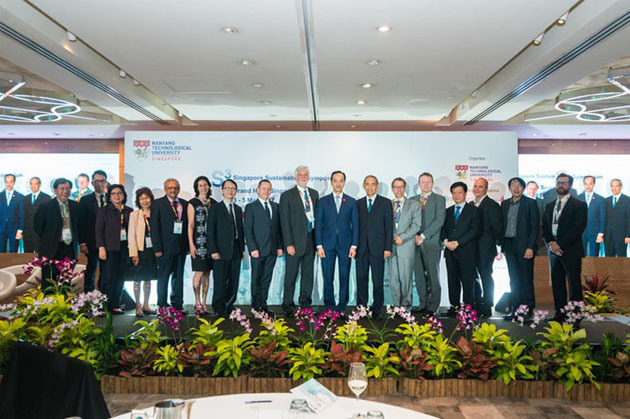 It was held on 15 and 16 August 2018 in Singapore and included participants from national governments, regional and international organisations, academia and think tanks, and non-governmental organisations. 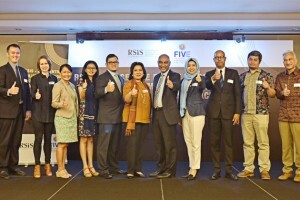 The RSIS World Humanitarian Day 2018 Public Panel & Exhibition was held on 14 August. The panellists were Senior Lieutenant Colonel Lim Kok Kheng, Head Plans and Coordination, Regional HADR Coordination Centre; Masahiro Ishizeki, Senior Manager, International Programmes, at Mercy Relief; and Lieutenant Colonel Ow Yong Tuck Wah, Head of Specialist Fire Training Centre, Singapore Civil Defence Force, Civil Defence Academy. The panel was moderated by Dr Alistair D.B. Cook, Coordinator of the Humanitarian Assistance and Disaster Relief Programme. It commemorated those who have offered their lives in humanitarian service and those in need of assistance, and celebrates the spirit that inspires humanitarian work. 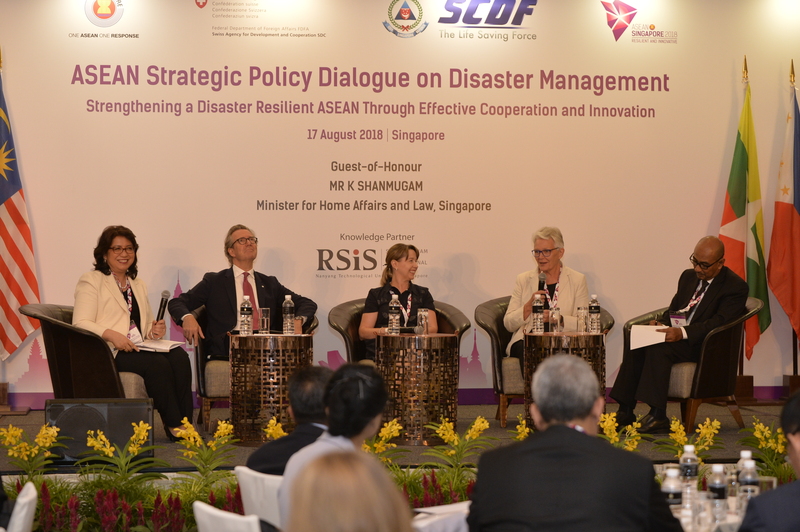 The panel discussion tackled the current nature of humanitarian engagement including the evolving landscape of complex humanitarian emergencies and international disaster relief in the Asia Pacific. It raised public awareness on humanitarian assistance and disaster relief in the region by providing a venue for exchange of ideas, insights and experiences from Singaporean citizens and residents of Singapore involved in the protection and assistance of vulnerable groups displaced by natural and manmade disaster. The exhibition provided a forum to meet academics, policy professionals and practitioners from the field of humanitarian affairs. Dr Catherine Jones, Visiting Fellow, RSIS; East Asia Research Fellow, Department Politics and International Studies, University of Warwick delivered an RSIS Seminar titled “Southeast Asian States and Peacekeeping: Niche Agency or No Agency?” on 1 August 2018. NTS Centre Head Assoc Prof Mely Anthony and Mr Julius Cesar Trajano participated in the Annual Meeting of the International Nuclear Security Education Network (INSEN) held at the International Atomic Energy Agency in Vienna, Austria from 9 to 13 July 2018. During the regional group session, Mr Trajano was chosen to chair the INSEN-Asia Group for 2018-19. 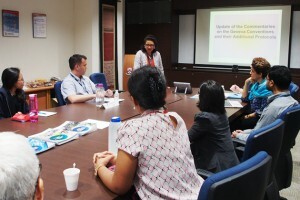 NTS Head Assoc Prof Mely Caballero Anthony speaking on migration challenges in Southeast Asia at the International Workshop on “Japan and Southeast Asia: Current Foreign Policy Issues in the Era of Global Change and Challenges” held at the Centre for Southeast Asian Studies ( CSEAS),Kyoto University on 29 June 2018. The workshop was jointly organised by CSEAS and the Konrad Adenauer Stiftung. 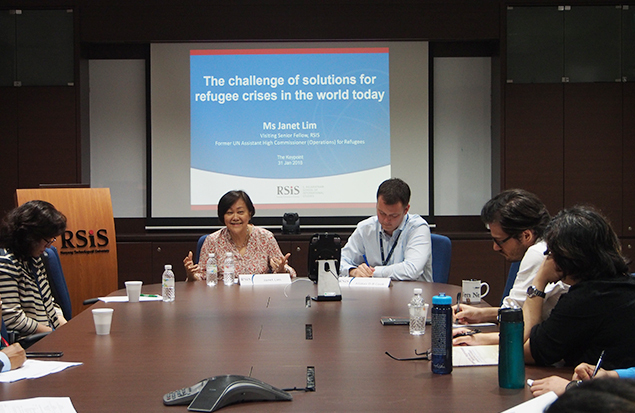 The Humanitarian Assistance and Disaster Relief Programme of RSIS’s Non-Traditional Security Centre hosted a roundtable on 11th June. 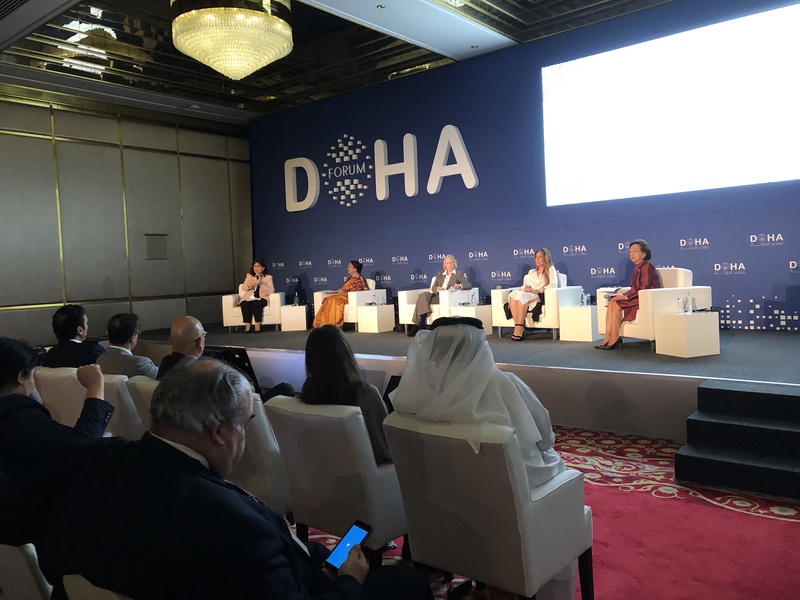 It discussed the critical questions that have arisen since humanitarian technology and innovation became a dedicated focus of the aid sector approximately ten years ago. The first panel – comprising speakers from academia and the aid sector – raised three challenges stemming from the rapid adoption of new technologies in humanitarianism. These were first the legacy impact on local government/society relations of outside responders using new technologies to enable dialogue with those they are assisting, in pursuit of accountability to beneficiaries. The second was the particular challenge of privacy when collecting data in conflict or disaster settings, both of which can render data acutely sensitive in ways that do not apply in ordinary contexts. 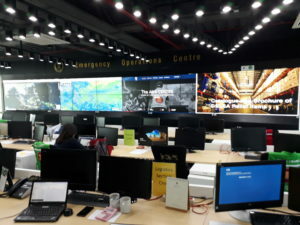 The third challenge noted how new technologies are being deployed by civil society disaster response actors in China in a way that challenges government monopolies on emergency action. This introduces a novel, technology-based tension into the relationship between aid and politics. The second panel – consisting of NGO and private sector practitioners – discussed specific experiences of innovating in East and Southeast Asian humanitarian response, and the lessons learned. These covered some of the pitfalls NGOs and private sector actors can face when collaborating with each other on innovative projects. Those challenges were particular stark for smaller firms and aid organisations. 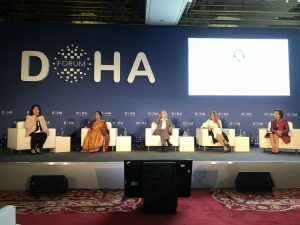 Finally, there was discussion of “solutionism” – of focusing excessively on particular answers instead of properly understanding the questions being presented to innovators – and how it can lead to innovations that at best do not respond to particular needs, and at worst undermine the effectiveness of aid operations. Paraphrasing one presenter, 90 per cent of time spent innovating should be dedicated to understanding the problem, and 10 per cent on proposing solutions. 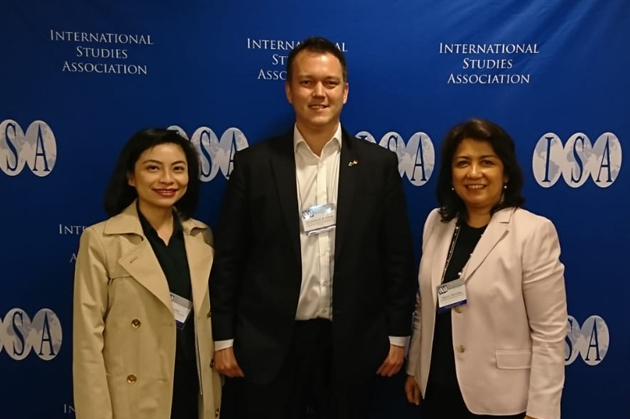 Staff of the NTS Centre participated in the 59th Annual Convention of the International Studies Association (ISA) from 4th to 7th April 2018 in San Francisco, California. Associate Professor Mely Caballero-Anthony, Head of NTS Centre, chaired the panel on international politics of disasters and presented her paper on regional organization and disaster management. She was also on the panel honouring Amitav Acharya, International Organization Distinguished Scholar, and discussant of another on global disaster governance. 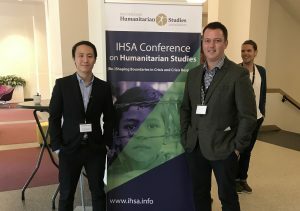 Dr Alistair Cook, Research Fellow and Coordinator of the Humanitarian Assistance and Disaster Relief (HADR) Programme, presented papers on reforming the global humanitarian system and climate change and refugees. He also discussed papers on foreign aid and security. Dr Lina Gong, Research Fellow, delivered a presentation on China’s participation in international security governance through UN peacekeeping. 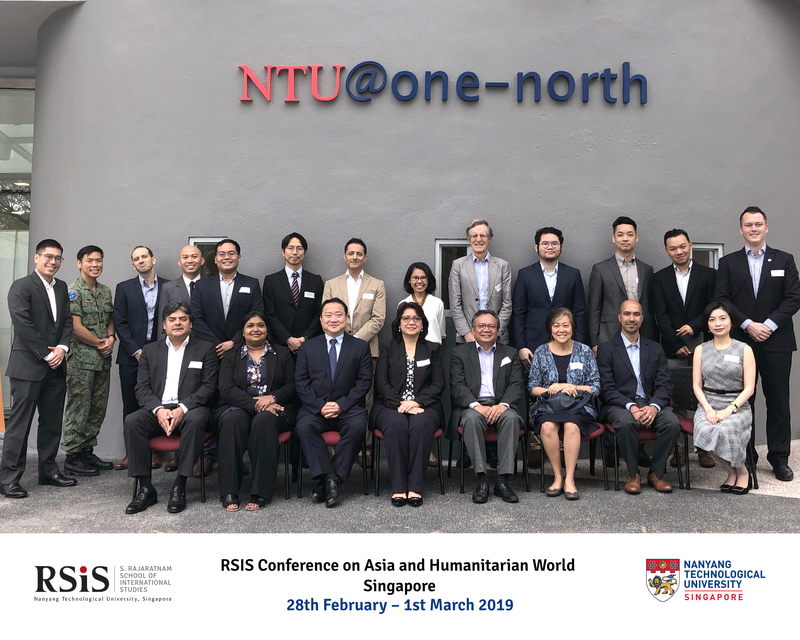 The RSIS Centre for Non-Traditional Security (NTS) Studies convened the annual conference of the NTS-Asia Consortium in Singapore on 27-28 March 2018. The conference brought together around 50 participants from 31 member-institutions of the Consortium and its non-member partners. The theme for this year’s conference was “Resilience in the Face of Disruptions.” The conference provided an enabling platform for Consortium members to discuss multidisciplinary approaches to building and strengthening resilience in the face of complex challenges brought about by disruptions. Ambassador Ong Keng Yong, Executive Deputy Chairman of RSIS, kicked off the conference with his keynote address on disruptions and resilience amidst climate change, environmental degradation, and the advent of new forms of technology. Ambassador Ong argued that while ‘disruption’ is not a new phenomenon, innovative and collaborative approaches are still needed to manage its implications. He emphasised that multilateralism and multi-stakeholder cooperation are crucial for finding sustainable solutions to transnational problems arising from disruptions. During the panel sessions, Consortium members deliberated on disruptions and resilience-building in five key areas, namely environment and climate change, agriculture and food security, humanitarian crisis and forced displacement, cyber technology, and democracy. They jointly examined the drivers of disruptions in these areas and their implications for states and societies from an NTS perspective. They likewise put forward recommendations that can help cultivate resilience among state and non-state stakeholders amidst complex challenges from disruptions. 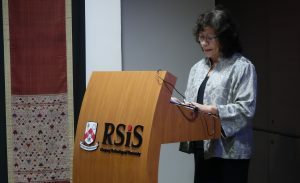 In her closing remarks, Assoc Prof Mely Caballero-Anthony, Head of the NTS Centre at RSIS and Secretary-General of NTS-Asia Consortium, highlighted the need to further understand the implications of emerging disruptions using an NTS lens and assess if there are sufficient governance mechanisms, institutions and norms to cope with the challenges. She thanked the members of the Consortium for their active participation and valuable contributions that made this year’s conference successful. The NTS Centre hosted a seminar titled “AHA Centre – The First Five Years” on Friday, 9th February 2018 delivered by Said Faisal, Visiting Senior Fellow with the Humanitarian Assistance and Disaster Relief programme and former inaugural executive director of the AHA Centre. The ASEAN Coordinating Centre for Humanitarian Assistance on disaster management (AHA Centre) is an intergovernmental organisation, established by the ten ASEAN Member States with the aim to facilitate cooperation and coordination of disaster management amongst ASEAN Member States. 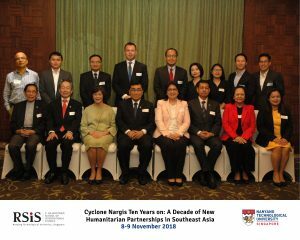 The Agreement on the Establishment of the ASEAN Coordinating Centre for Humanitarian Assistance on disaster management was signed by ASEAN Foreign Ministers on 17 November 2011, and witnessed by the Heads of States of all ten ASEAN countries. 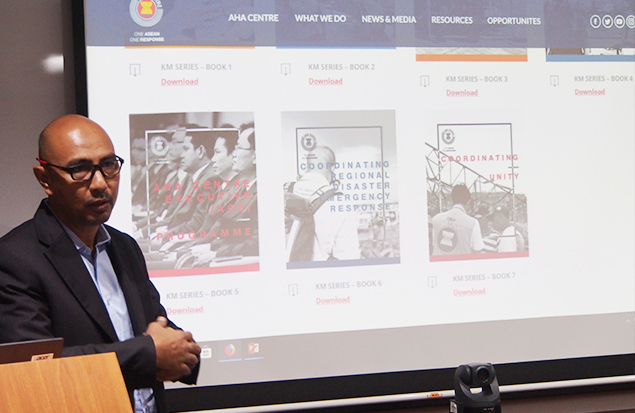 In operationalising its mandate, the AHA Centre primarily works with the National Disaster Management Organisations (NDMO) of the ASEAN Member States. The AHA Centre also partners with international organisations, private sector, and civil society organisations, such as the Red Cross and Red Crescent Movement, the United Nations, and AADMER Partnership Group. Said Faisal was appointed the inaugural Executive Director of the AHA Centre for a term of five years from 2011 to 2016. In this seminar Said Faisal reflected on his experience establishing the coordination centre, working with the Conference of the Parties to implement his vision and the challenges faced in operationalizing its mandate. The NTS Centre hosted a seminar titled “Mediation for Peace: Conflict Prevention and Early Action” on Wednesday, 7th February 2018 delivered by Dr Noeleen Heyzer, Distinguished Visiting Fellow and Former Under-Secretary-General of the United Nations. Dr Heyzer highlighted the international community’s inability to respond adequately to complex and protracted conflicts, which has led to unbearable human suffering and the largest forced displacement since World War Two. This has led to the new Secretary General of the United Nations being determined to prioritise early action and to leverage effective diplomatic networks to prevent wars, to build fairer, resilient and more inclusive societies. The UN Secretary-General has called for a surge in diplomacy for peace and has emphasized mediation and dialogue at the international, regional and local levels as important tools in this regard. As a member of his recently established High Level Advisory Board on Mediation, Dr Heyzer looked at some of the current challenges to mediation, factors that support mediation and the use of a more comprehensive approach for addressing both the drivers of conflict and the drivers of peace, bringing together the Sustaining Peace Agenda, UN Security Council Resolution 1325 on Women, Peace and Security, and the 2030 Sustainable Development Agenda to “leave no one behind”. 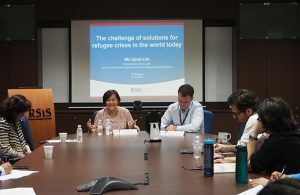 The NTS Centre hosted a seminar titled “The Challenge of Solutions for Refugee Crises in the World Today” on Wednesday, 31st January 2018 delivered by Janet Lim, Visiting Senior Fellow with the Humanitarian Assistance and Disaster Relief programme and former UN Assistant High Commissioner (Operations) for Refugees. Janet Lim explored the challenge of solutions from the perspectives of prevention and when refugees crises have already occurred. This focus is borne out of the refugee crises arising out of conflicts in different parts of the world increasing not only in numbers, but also in complexities. 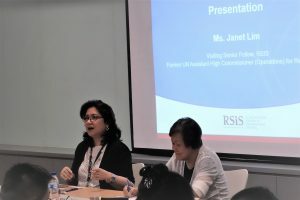 Janet Lim observed that the traditional solutions from the past are increasingly being challenged and instead countries are resorting to unilateral measures such as building walls and closing borders, which have aggravated the humanitarian costs. 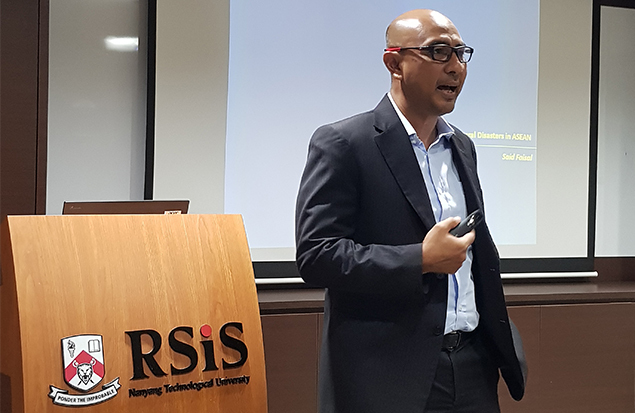 The NTS Centre hosted a seminar titled “Catalysts for change: Natural Disasters in ASEAN” on Thursday, 25th January 2018 delivered by Said Faisal, Visiting Senior Fellow with the Humanitarian Assistance and Disaster Relief programme and former inaugural executive director of the AHA Centre. Said Faisal shared his experience of how the devastating effects of the 2004 Indian Ocean Tsunami and 2008 Cyclone Nargis were catalysts for change in regional cooperation on disaster management within the ASEAN context. 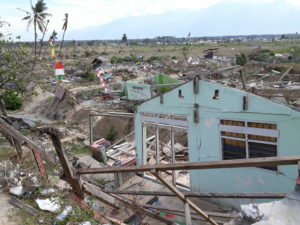 These events ultimately led to the ASEAN Agreement on Disaster Management and Emergency Response which came into effect on 24 December 2009, and subsequently led to the establishment of the AHA Centre in 2011. He shared with participants his personal experience in the evolution of regional cooperation in response to natural disasters. 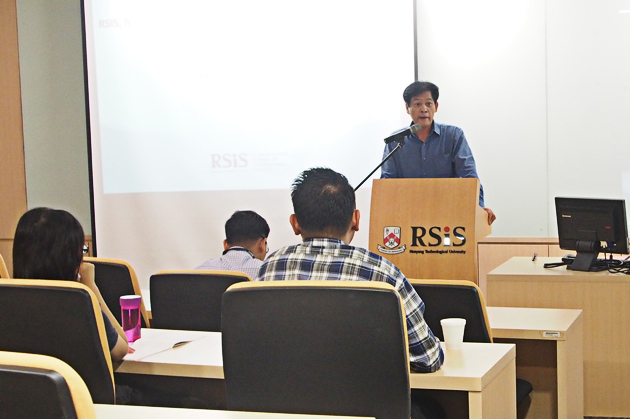 RSIS’ Centre for Non-Traditional Security Studies (NTS Centre) organised a seminar on the Rohingya crisis titled, ‘Rohingya Resettlement and Rehabilitation: Opportunities and Challenges’ on 13 December 2017. Dr Nehginpao Kipgen, an Assistant Professor and Executive Director at the Centre for Southeast Asian Studies in the Jindal School of International Affairs, O.P. Jindal Global University, India, delivered the seminar. The seminar was moderated by Dr Alistair Cook, Research Fellow at the NTS Centre and Coordinator of the Humanitarian Assistance and Disaster Relief (HADR) Programme in the school. The event was well received by an audience including university students, academics and government officials. Dr Kipgen provided a well-rounded perspective on the historical background of the Rohingya people and what was perceived as the challenges in Rakhine state by the government and the international community. He also gave interesting insights on the various resolutions that were debated internationally on how the Rohingya crisis could be resolved. Some of the resolutions include the provision of citizenship to the stateless population, ordering a ceasefire in the state and depending on the international community to develop Rakhine. Dr Kipgen highlighted the potential challenges that could arise as a result of some of these recommendations and stressed that the current situation is extremely complex and there is a need for people to understand the problem in detail before determining how the situation can be improved. From Dr Kipgen’s perspective, the government, military and civil society have to play a role to ease the crisis in Myanmar. All three need to change their perspective on the Rohingya people. It is also critical for IDP and refugee camps to be closed to prevent further atrocities from occurring in them and to be able to make concrete changes to the living conditions of the Rohingya people. On 13th November 2017, the Humanitarian Assistance and Disaster Relief Programme at the Centre for Non-Traditional Security Studies (NTS Centre) hosted a consultation on the fourth edition of The Sphere Project’s Humanitarian Charter and Minimum Standards in Humanitarian Response (the Sphere Handbook). Representatives from humanitarian organisations, the armed forces and academics participated in this closed-door discussion. This consultation is part of a global engagement of humanitarian actors to gather feedback and recommendations for the revision of the Sphere Handbook. 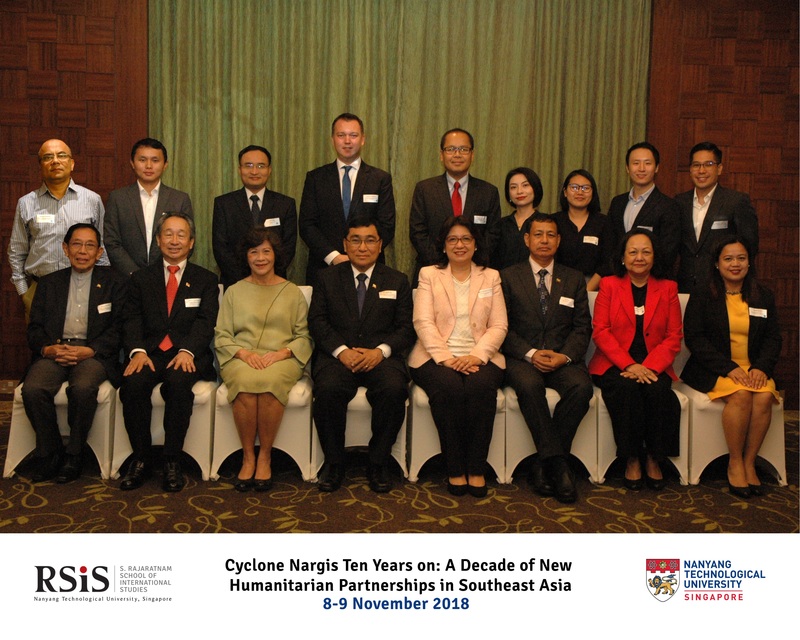 On 13th November, the Humanitarian Assistance and Disaster Relief Programme at the Centre for Non-Traditional Security Studies (NTS Centre) hosted the second Singapore Humanitarian Network meeting. 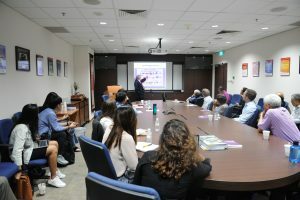 The meeting brought together Singapore-based researchers who work on humanitarian affairs and disaster relief to share their research interests. It covered topics from emerging humanitarian landscape and trends, challenges in the field, research methodologies to opportunities for collaboration among researchers in Singapore. 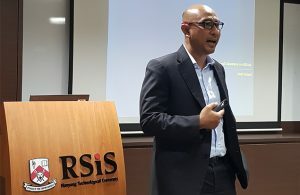 On 14th November 2017, the Humanitarian Assistance and Disaster Relief Programme at the Centre for Non-Traditional Security Studies (NTS Centre) hosted a RSIS Roundtable with Said Faisal, former Executive Director of the ASEAN Coordinating Centre for Humanitarian Assistance on disaster management (the AHA Centre). In a presentation titled, “Key Strategic Issues in Managing Disaster”, Said Faisal share his experience on the importance of institutions and global engagement for disaster management, the use of innovation and technology and the need to professionalise the humanitarian sector. 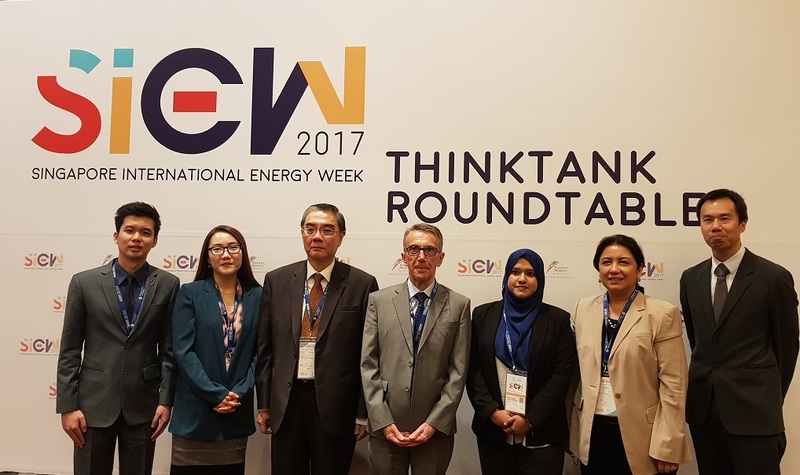 The RSIS’ Centre for Non-Traditional Security Studies, in coordination with the Energy Market Authority, organised a think-tank roundtable on “Nuclear Safety and Security Culture: Powering Nuclear Governance in East Asia” at the 10th Singapore International Energy Week on 27 October 2017. This roundtable facilitated policy discussions and constructive debates among nuclear energy experts on national and regional initiatives to promote nuclear safety-security culture in East Asia. 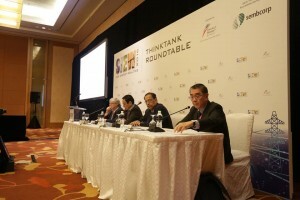 Roundtable speakers include Dr Phiphat Phruksarojanakun, Head of International Cooperation Section, Office of Atoms for Peace, Thailand; Ms Sabariah Bt Kader Ibrahim, Head of International Training Sector, Nuclear Malaysia Training Centre, Malaysia Nuclear Agency; Dr Alvin Chew, Adjunct Fellow, RSIS; Dr Claude Guet; Programme Director at Energy Research Institute at NTU and Senior Advisor to the CEO of CEA (French Alternative Energies and Atomic Energy Commission); and Dr Su Jin Jung, Manager of Strategy and Performance Department, Korea Institute of Nuclear Safety. 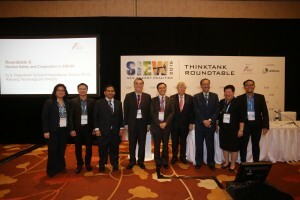 A total of 80 delegates from Singapore government agencies, energy companies, academia, regional think-tanks, and NGOs participated in the roundtable discussions. On 26th October 2017, Baroness Valerie Amos, CH who is the current Director of SOAS, University of London, UK and served as the eighth UN Under-Secretary-General for Humanitarian Affairs and Emergency Relief Coordinator began her visit to Singapore to deliver the S T Lee Distinguished Annual Lecture, accompanied by Professor Stephen Hopgood. 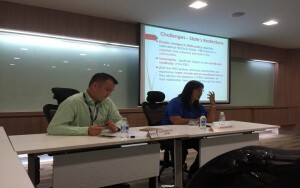 Her first day included a briefing with RSIS and the Centre for Non-Traditional Security Studies. It was followed by a closed-door roundtable discussion with RSIS faculty, staff and students on the future of humanitarianism. In the afternoon she paid a visit to the Changi Regional HADR Command and Control Centre. On 27th October 2017, Baroness Valerie Amos delivered the S T Lee Distinguished Annual Lecture titled A World Turned Upside Down at the Intercontinental Hotel, Singapore. 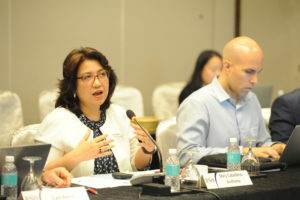 Head of NTS Centre, Associate Prof Dr Mely Caballero Anthony at the High Level Forum on [email protected], organised by Department of Foreign Affairs and Foreign Service Institute of the Philippines, and Economic Research Institute for ASEAN (ERIA) on 19 October, Manila, Philippines. (Left to right): Prof Mely Caballero Anthony, Dr Mari Pangestu (former Minister of Trade and Minister of Creative Economy, Indonesia) and Ambassador Delia Albert(former Secretary of Foreign Affairs, Philippines). 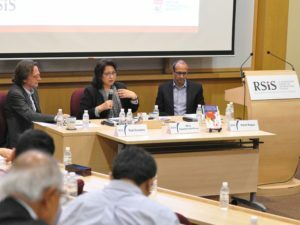 The S. Rajaratnam School of International Studies (RSIS) Centre for Non-Traditional Security (NTS) Studies organised a seminar titled, â€˜Mass Movement of Refugees and Migrants: How is the world community dealing with one of the biggest problems of our time?’ at the RSIS Seminar Rooms 1 and 2 on 17 October 2017. 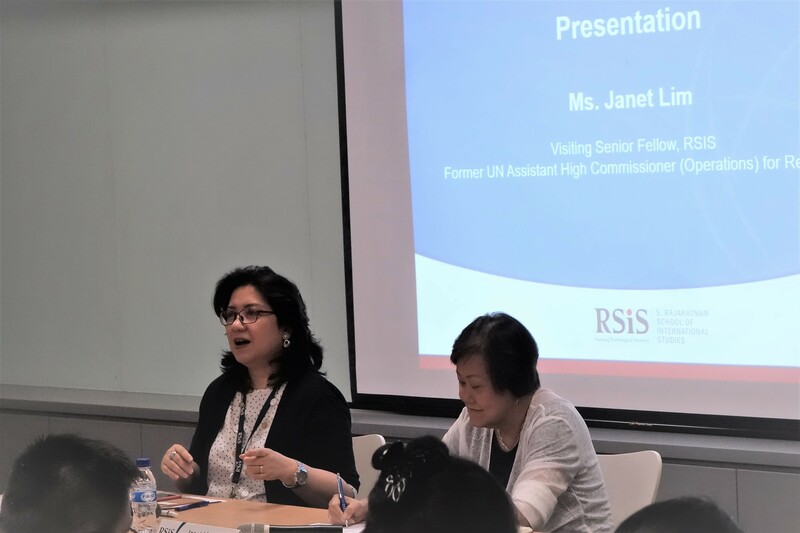 The former UN Assistant High Commissioner (Operations) for Refugees, Ms Janet Lim, who is currently a Visiting Senior Fellow at RSIS, delivered the seminar and was moderated by Associate Professor Mely Caballero-Anthony, NTS Centre Head. Ms Janet Lim discussed the adoption of the New York Declaration for Refugees and Migrants and its relevance to the movement of people in Asia, particularly in the current crises in Myanmar, Bangladesh and the Philippines. She elaborated on whether such global compacts will be successful when implemented in the region. She explored ideas on how the region could be more operationally ready to deal with the refugee crisis and how regional organisations could play a role to overcome some of the challenges. The event was well-received by audience from various institutions and embassies. The S. Rajaratnam School of International Studies visited Yangon and Naypyidaw from 13th to 15th September 2017 to engage with Think Tanks and educational institutions and to co-host a seminar with the Ministry of Social Welfare, Relief and Resettlement led by Union Minister Dr Win Myat Aye. The seminar was co-hosted forÂ Â the Myanmar National Natural Disaster Management Committee drawing participation from across government ministries and the national red cross society. The RSIS delegation was led by Ambassador Ong Keng Yong and accompanied by Associate Professor Mely Caballero-Anthony, Ms Kang Siew Kheng, Dr Alistair D. B. Cook, Ms Hnin Nu Wai and Ms Rajni Gamage. 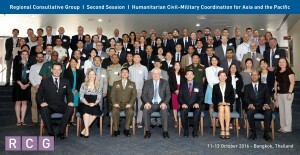 In addition to the seminar the delegation met with Thayninga Institute for Strategic Studies, Centre for Strategic and International Studies, National Defence College, Myanmar Institute for Strategic and International Studies, Enlightened Myanmar Research Foundation, Tampadipa Institute and the University of Yangon to explore potential collaboration and share views on current trends on humanitarian assistance and disaster relief and maritime security. The RSIS’ Centre for Non-Traditional Security (NTS) Studies and the Centre for Humanitarian Dialogue (HD) co-organised a public seminar on the Mindanao conflict at RSIS Lecture Theatre on 18 September 2017. 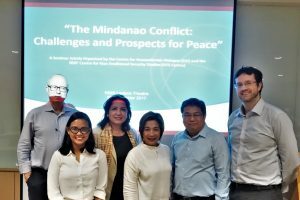 The seminar featured two researcher-practitioners working at the frontlines of the conflict in the southern Philippines. They are Mr Benedicto Bacani, Executive Director of the Institute for Autonomy and Governance (IAG), and Ms Rosemain â€œDadangâ€ Abduraji, Executive Director of Sulu-based NGO Tumikang Sama-Sama (TSS). Mr Bacani shared the findings of IAG’s research on youth vulnerability to violent extremism in the Autonomous Region of Muslim Mindanao. He pointed out that until now; there has been no evidence-based data to develop policies and programmes that effectively respond to the Muslim youth’s vulnerability to extremism. IAG’s research findings show that awareness among youth on what constitutes extremism is limited and their attitude is ambivalent. Poverty, limited access to education, and corruption are among the most commonly identified push factors that may drive young Filipino Muslims to join extremist groups. Meanwhile, recruitment through the charismatic influence of extremist leaders, cash incentives, and the promise of fraternal bonding are identified pull factors. Ms “Dadang” Abduraji narrated how TSS, an organisation of community mediators, helps resolve Rido or clan wars, in Sulu Province, Mindanao. She noted that clan wars have further complicated the delicate security situation in Sulu, the hometown of the Abu Sayyaf Group and the Moro National Liberation Front. Rido creates demand for weapons, forces people to align with hard-line groups to protect themselves, breeds a culture of violence, and prevents economic development. TSS uses a combination of legal mechanisms and indigenous traditions, which are central to the lives of Tausugs (people of Sulu), to mediate clan conflicts. It also seeks the participation of community elders, religious leaders, and village officials. TSS also facilitates ceasefire agreements and traditional peace covenants between warring families. 2017 will be a decisive year for global agriculture and trade. Recent political changes will have a profound impact on the way we produce and distribute food. 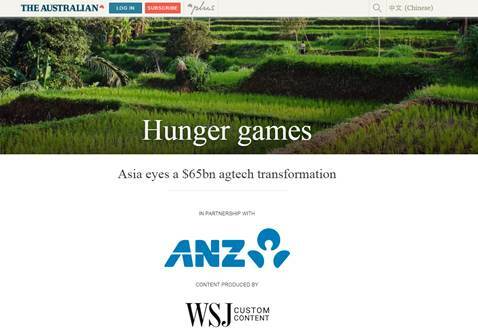 In this, Asia will play a critical and leading role. The region has more than half of the world’s population, is home to fast growing economies and faces numerous environmental challenges. 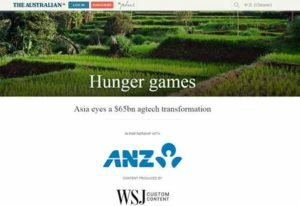 At this year’s conference in Singapore, the World Agricultural Forum (WAF) will provide new insights on how governments, the private sector and non-governmental organisations are preparing for the future of agriculture in Asia. 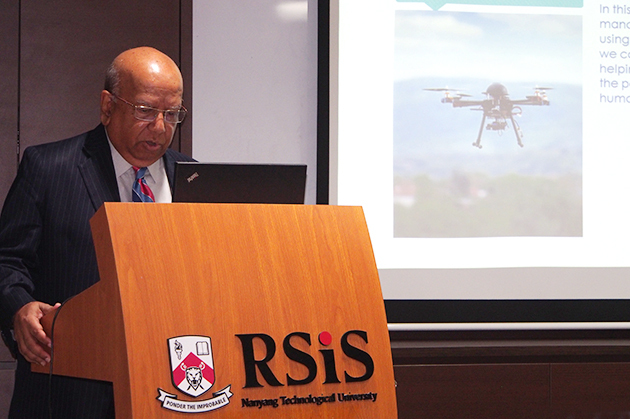 Co-hosted by the S. Rajaratnam School of International Studies (RSIS), Nanyang Technological University, on 6-7 July, the conference will serve as a global platform to encourage dialogue among those who can and will create an impact. It will brainstorm the following themes: 1) Agriculture and Food Trade in the New World Order; 2) Imperatives for Securing the Food Production Base; 3) Technologies to Promote Sustainable Farming and Food Security; and 4) Good Governance, Partnerships and Agricultural ProductivityÂ. The conference also seeks to provide recommendations for policymakers and investors. Political and business leaders around the world will benefit from this event as the World Agricultural Forum is a unique platform where new technologies and innovations in agriculture converge. The RSIS Centre for Non-Traditional Security (NTS) Studies and the Embassy of the Philippines jointly organised a panel discussion on Women, Peace and Security (WPS) in Southeast Asia at the RSIS Lecture Theatre on 21 July 2017. The Ambassador of the Philippines H.E. Antonio Morales and Assoc Prof Mely Caballero-Anthony, Head of the NTS Centre, in their welcome remarks, highlighted the achievements of ASEAN in promoting and protecting women’s rights in recent years and the relevance of the WPS agenda in the region where women are among the vulnerable groups in both conflict and natural disaster settings. Panel speakers include Dr Ma. Lourdes Veneracion-Rallonza, Assistant Professor, Department of Political Science, Ateneo de Manila University; Ms. Rahimah Abdulrahim Executive Director, The Habibie Centre in Jakarta; and Ms. Katrina Jorene Maliamauv Programme Officer, Tenaganita Sdn Bhd in Kuala Lumpur. Dr Rallonza argued that the WPS agenda needs to be applied to both natural disaster and armed conflict settings. Given that several ASEAN Member States have been plagued by protracted conflicts and natural disasters, there is a need to locate gender issues, particularly the protection of women’s rights, in the interface of armed conflicts and natural disasters. 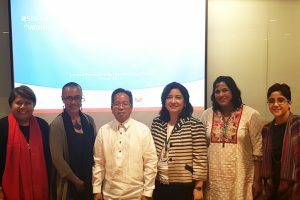 Dr Rallonza reviewed several institutional mechanisms and policy initiatives of the Philippines, along with other ASEAN Member States in enhancing the WPS agenda. She proposed the creation of a regional technical working group in ASEAN to draft a regional plan of action on mainstreaming women’s rights protection in both conflict and disaster situations in Southeast Asia. 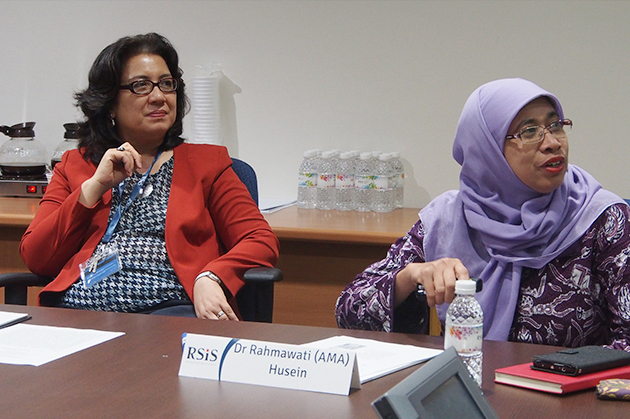 Ms. Rahimah discussed the level of women’s participation in politics and public policymaking in Southeast Asia. 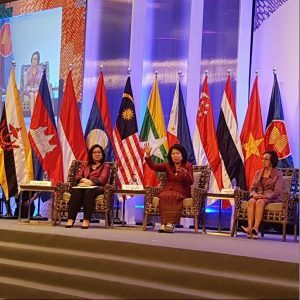 To illustrate the limited participation of women in politics, she cited the low percentage of female members of parliaments and cabinets in ASEAN Member States. Due to deeply rooted institutional limitations to increased female participation in politics, she recognized the role of CSOs in advancing civic engagement for women by women. CSOs can provide women the political space to organise and articulate their rights. Nonetheless, there is an urgent need to have institutional reforms to increase women’s access to politics and policymaking. Ms. Maliamauv focused on the plights of abused female migrants, refugees, and victims of human trafficking in Southeast Asia. She presented case studies of abused female domestic workers and Rohingya refugees and accentuated the lack of protection agenda for this vulnerable sector at the regional and national levels in Southeast Asia. The particular use of language and its power in determining mindsets, with reference to female migrant workers especially in national legislation, was also a concern that was highlighted by Ms Maliamauv. 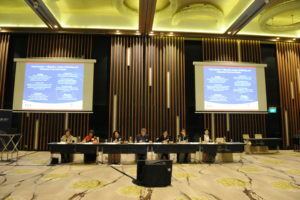 The open forum discussions explored several mechanisms that can mainstream the WPS agenda at various levels, from ASEAN, to national governments, business sector and down to communities. The security sector, including the military, for instance, needs to be constructively engaged in and sensitised to the protection of women’s rights, given that the military is a main actor in both armed conflicts and disaster response operations in the region. More importantly, there must be a change of mindset at various levels in terms of the role of women, their access to security, including human security, and their inherent vulnerabilities in conflict and disaster settings. 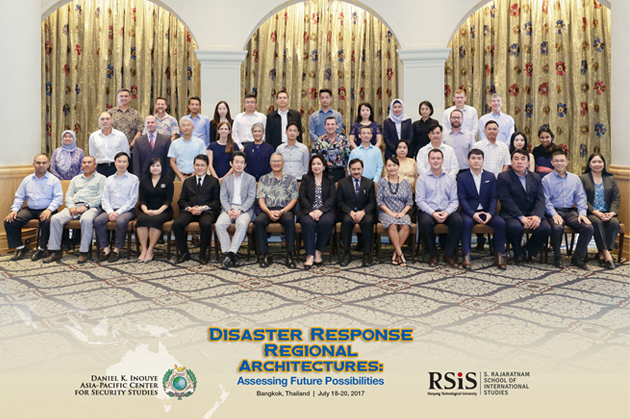 The S. Rajaratnam School of International Studies and the Daniel K. Inouye Asia-Pacific Center for Security Studies co-hosted a workshop titled “Disaster Response Regional Architectures: Assessing Future Possibilities” from 18th to 20th July 2017 to facilitate analysis among relevant stakeholders and subject matter experts to achieve a common understanding of challenges and opportunities associated with regional disaster response coordination in four distinct Asia-Pacific regions; identify current and emerging response-related issues, trends and strategic implications; and make recommendations for improved and collaborative regional disaster response architectures. The workshop findings will be jointly published by RSIS and DKI APCSS in a report for public distribution. 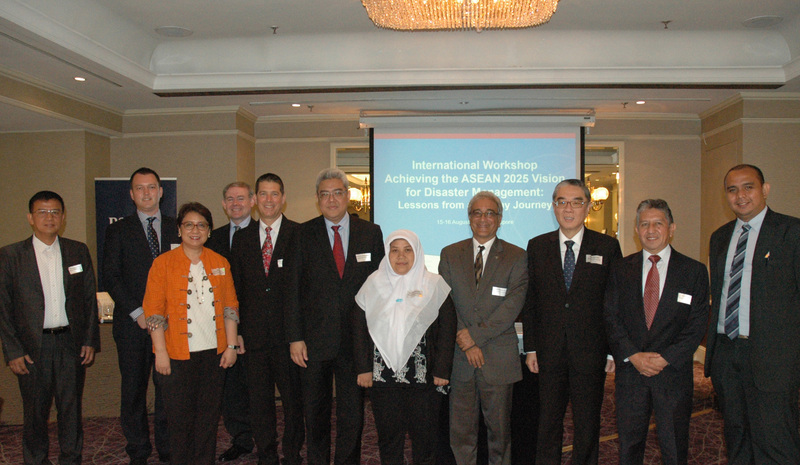 A total of 43 participants from 14 Indo-Asia-Pacific states and Taiwan attended the workshop. Workshop participants had a mixture of professional backgrounds leading and/or coordinating disaster management sharing efforts to include international, regional and civil society organizations, defence ministry officials, foreign affairs and national disaster management bodies. 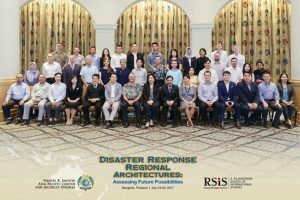 U.S. participants included the United States Agency for International Development, Office for Foreign Disaster Assistance, Joint U.S. Military Advisory Group, Center for Excellence in Disaster Management (CFE-DM). Non-national participants included representatives from the United Nations Office for the Coordination of Humanitarian Affairs, the ASEAN Humanitarian Assistance Centre (AHA Centre), and the South Asia Association for Regional Cooperation (SAARC) Disaster Management Centre, the World Food Programme (WFP), and the International Council of Volunteer Agencies (ICVA). The RSIS Centre for Non-Traditional Security Studies organised a special one-day lecture on “Nuclear Safety-Security Interface and Emergency Preparedness and Response” at the RSIS Keypoint on 19 June 2017. 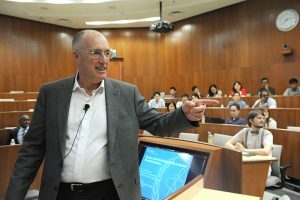 The special lecture was delivered by Dr. Edward Waller, Professor at the Faculty of Energy Systems and Nuclear Science, University of Ontario Institute of Technology (UOIT), Canada. 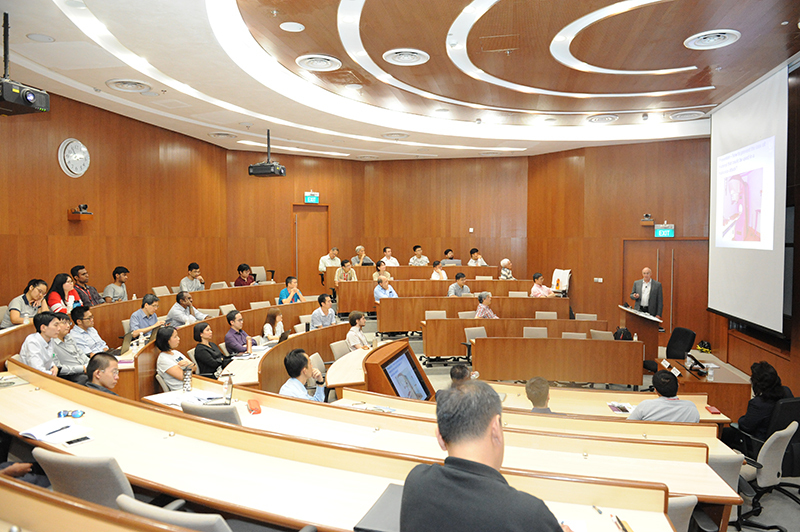 22 participants from government agencies and research institutes of NTU and NUS attended the lecture. This lecture considered the similarities and differences between accidents and malicious acts involving nuclear or radiological material, and the contrast in response from planning, preparation, assessment, resourcing and execution. Specific topics included safety-security culture, security by design, material control and accountancy, reliability-centred maintenance and the use of modelling and simulation. 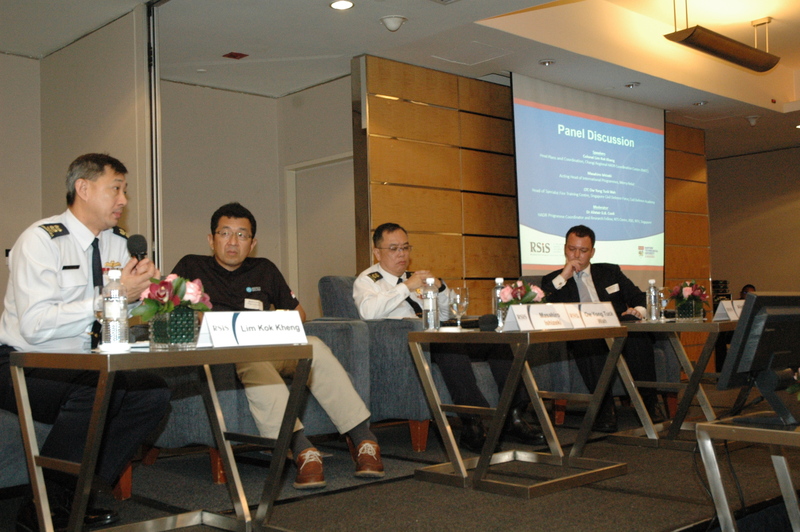 A framework for emergency response personnel to work with security responders was also presented for discussion. This lecture discussed, in broad terms, the major components related to international guidance on radiation emergency management, based primarily on IAEA GSR Part 7. It was proposed that the topics discussed form the basis of local training in emergency preparedness and response. This lecture is a collaboration on nuclear security education and research between two members of the International Nuclear Security Education Network (INSEN). 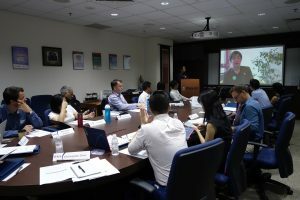 JUN 1, 2017: The S. Rajaratnam School of International Studies (RSIS) hosted the University of Southern California – Singapore Management University undergraduate summer programme titled “America’s Pacific Century: Dialogue between the United States and Asia’ to interview experts and policy professionals (May 15 – 19 in Washington, D.C.; and May 22 – 26 on USC campus in Los Angeles; and May 29 to June 8 in Singapore). 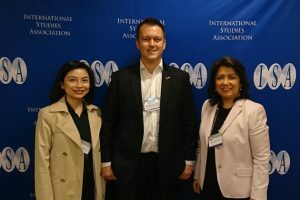 RSIS’ Evan Resnick, Rini Astuti and Jo Franco discussed the new US administration and its impact on East Asia, which was moderated by Al Cook. The students are expected to produce a task force report on the New US Administration and will make a presentation at a public forum to be hosted by the American Chamber of Commerce, Singapore. Geanina Bujoreanu discussed the postgraduate programmes on offer at RSIS. “We focus on regional frameworks, and emphasize the need to work together because when it comes to sustainable development and sustainable security, it is not possible to go it alone.” This was a key message that Assoc. 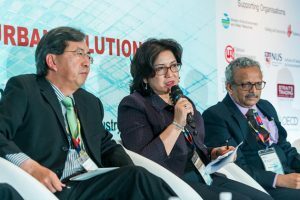 Prof. Mely Caballero-Anthony, Head of the Centre for Non-Traditional Security (NTS) Studies, RSIS, contributed at the opening discussion panel of the fourth annual Singapore Sustainability Symposium (S3) in Singapore on 3-5 May 2017 at Grand Hyatt Singapore. S3 is an initiative of Nanyang Technological University (NTU), in partnership with Singapore’s Ministries, Singapore university partners and private sector collaborators. 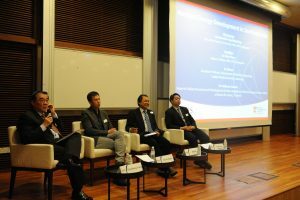 Themed “Civic Engagement Driving Urban Solutions”, the event looked at topics such as innovation and technology, governance and laws, and economics and financial incentives. Prof Alexander J.B. Zehnder, member of NTU’s Board of Trustees and Chair of the Sustainable Earth Office, set the scene by highlighting the interactive nature of S3, wherein solutions would come not only from the speakers but from the participants as well. 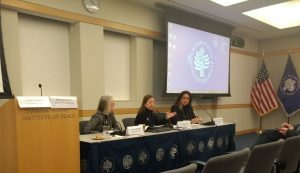 Discussions brought forth insights such as the need for a “chief silo buster” in any organization wishing to develop resilience; the role of consumers in demanding more sustainable products; and how members of civil society, as data generators, are instrumental to sustainable policy-making. Another interesting insight was that during crises, debates between top-down and bottom-up governance become secondary to the need to bring everyone together. Last, to address the critical concern of waste management, there were proposals of transforming business and financial models to allow for a “circular economy” economy to emerge. In such an economy, products would no longer be purchased, but rather, rented out so that as a service. That way, products can be recycled and resold by the lessors at the end of their lifetime. Guest-of-Honour Dr. Koh Poh Koon, Senior Minister of State, Ministry of Trade and Industry & Ministry of National Development, gave a foresighted speech at the opening night, when he stressed the importance of conducive environments for experimentation, collaboration across partners, and frameworks that can guide and scale up successful urban solutions. The forum has shown that universities can provide venues for furthering all these, by sharing latest knowledge and developing new thinking on how to solve urban problems, both old and new. 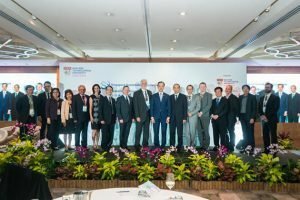 The RSIS Centre for Non-Traditional Studies (NTS) hosted the NTS-Asia Consortium Annual Conference “Climate Change and Sustainable Development Goals in the Asia Pacific” in Singapore on 30-31 March 2017. The Conference brought together members of the Consortium from India, Sri Lanka, Bangladesh, China, Japan, South Korea, Australia, Indonesia, Malaysia, Vietnam, and the Philippines, and invited guests from Nepal, Taiwan, Myanmar, Thailand, Cambodia, Lao PDR, Brunei Darussalam, and Timor Leste. The RSIS Centre of NTS Studies serves as the Secretariat of the Consortium. 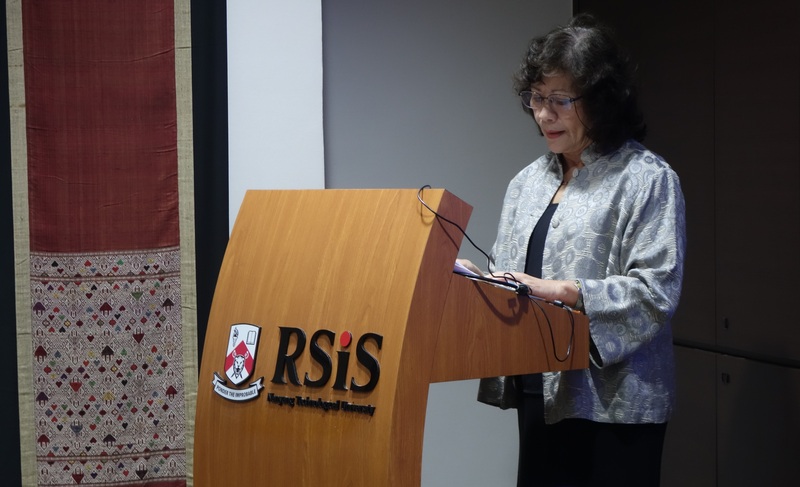 Dr Noeleen Heyzer, Former Under-Secretary-General of the United Nations (2007-2015) and Distinguished Visiting Fellow at RSIS, delivered the Keynote Address at the Opening Session of the Conference. Over a hundred people, including some students from Cedar Girls’ Secondary School, attended the opening session. In her speech, Dr Heyzer remarked that climate change is a real concern, and while plans and frameworks such as the Sustainable Development Goals (SDGs) are already in place, implementations remain a challenge. She highlighted five ways or ‘transmission mechanisms’ by which climate change can affect human lives: 1) agri-culture production and food security, 2) water stress and water insecurity, 3) rising sea levels and exposure to climate disasters, 4) ecosystems and biodiversity, and 5) human health. Dr Heyzer called for shared responsibilities and collective leadership, and proposed a Public-Private-People Partnership model as a way to tackling climate change and its potential debilitating impacts on human civilisation. She especially emphasised on the ‘people’ element, and suggested that efforts can begin locally and within households. Dr Heyzer also pointed out that technology can play a significant role in addressing some climate-related challenges. In conclusion, Dr. Heyzer reminded the audience that while efforts to counter climate change seem rather slow, there is so much goodness, inspiration and idealism in the world that one can tap into in order to continue to carry out the good work towards sustainable development. 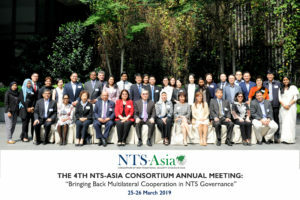 Four panel sessions then followed, with the NTS-Asia Consortium members and some selected guests participating as speakers, moderators and discussants. Panel 1 discussed about Climate Change and SDGs on Food, Energy and Water. The effects of climate change on water shortage were increasingly evident, and enhancing climate projection capability is important to enable better anticipatory responses. The unabated use of fossil fuel since the 18th century Industrial Revolution is among the primary drivers of climate change. As human civilisation has signifcantly impacted the nature, climate change issues need to be analysed from both nature and human lenses. Regardless of the numerous climate challenges, many countries have come together to build a climate change regime that is participatory and inclusive. This multi-stakeholder involvement model can be replicated in the efforts to achieving SDGs. Panel 2 talked about Climate Change and SDGs on Education, Sustainable Cities and Life below Water (Fisheries)/Life on Land (Forestry). The Philippines’ experience in addressing climate change shows that there is a need for capacity building, a more robust database and a stronger institution to support and implement existing mechanisms, a clear finance roadmap, and increased private sector participation. Singapore’s approach to building sustainable city-state can provide good examples to addressing challenges in urban sustainability. A study on soil degradation in a region in Timor Leste shows that soil in upstream, midstream, and downstream areas is impacted differently. Dam building activities in the Mekong River may saturate its capacity to support the lives of millions of people, and may therefore result in mass migration in their bids to find other livelihoods elsewhere. Panel 3 focused on Climate Change and SDGs on Gender, Poverty and Health. 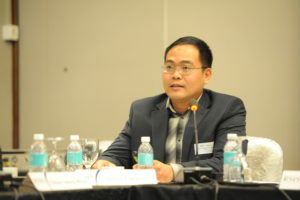 The Indonesia’s experience showed that while national development planning has incorporated climate change agenda, bigger challenges are found in integrating relevant strategies in local governments’ development plan and budget and in empowering communicates and households, strengthening their livelihoods and reducing vulnerability in sustainable ways. The Myanmar’s experience in providing health services highlighted accessibility challenges especially for the more vulnerable segments of the society. While climate-driven migration is often seen as failures in implementing adaptation strategies, it could also be regarded as an adaptation tool to combat climate change itself. Considering that climate change has all-encompassing impacts on the SDGs, sustainable development diplomacy can potentially provide a platform to address climate challenges. Panel 4 deliberated on Climate Change and SDGs on Partnership, Peace and Security. Three ways by which climate change can affect peace and security in the Asia Pacific include increased frequency and severity of disaster events, a global power shift, and an end of multilateralism. Some empirical evidence already shows a linkage between climate change and increased probability of armed conflict; as such, incorporating climate-induced migration and conflict management strategies in climate change policies may become necessary. Additionally, considering peace, development and SDGs are interrelated, addressing marginalisation and inequality as catalysts of potential climate-driven conflicts is critical. 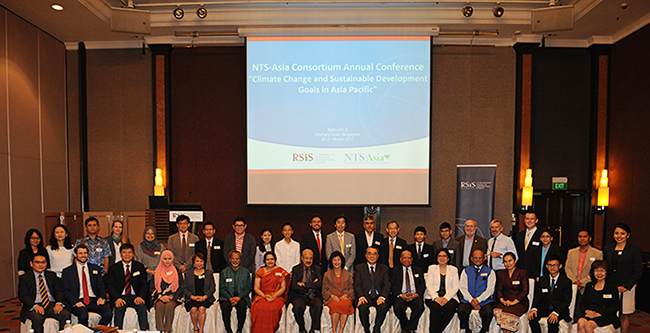 The NTS-Asia Consortium Conference concluded with a session on the NTS-Asia Consortium matters. 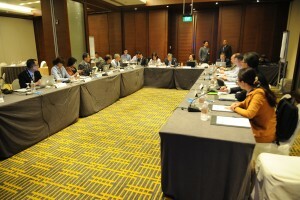 The new NTS-Asia website was presented, and the Consortium members exchanged ideas on how to move the Consortium forward. RSIS Centre for Non-Traditional Security (NTS) Studies and Pacific Forum-CSIS co-organised the 7th meeting of the Nuclear Energy Experts Group of the Council for Security Cooperation in the Asia-Pacific (CSCAP) at Hotel Jen Tanglin in Singapore from 27-28 February 2017. 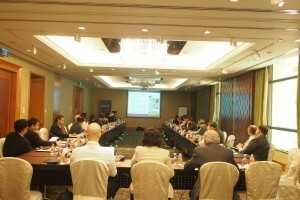 Forty participants and nuclear experts from 14 Asia-Pacific countries, including Singapore, deliberated on nuclear power development and nuclear governance in the Asia-Pacific; physical protection of nuclear facilities; cyber nuclear security threats; radioactive sources management; and public opinion, education and training. Assoc Prof Mely Anthony, Head of NTS Centre, co-chaired the NEEG meeting while Mr Julius Cesar Trajano, Associate Research Fellow at NTS Centre, delivered a presentation on nuclear energy plans in Southeast Asia, including the significance of Vietnam’s decision to scrap its nuclear power project. 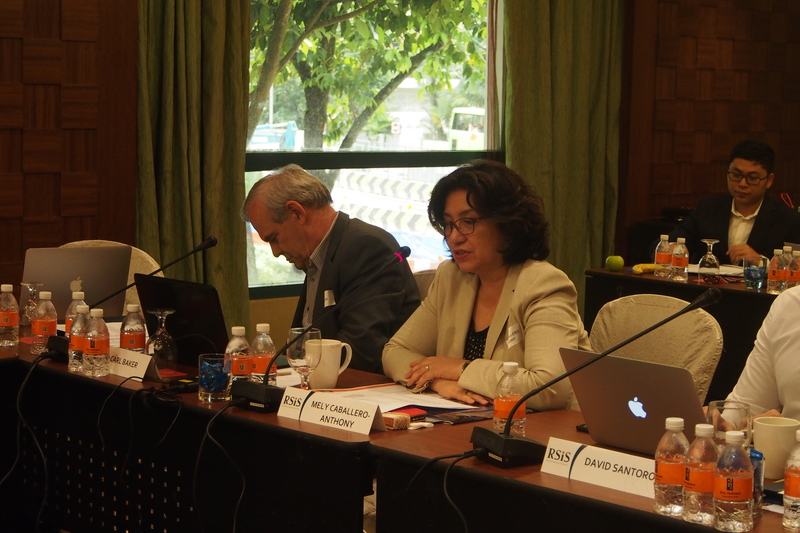 Participants identified the challenges to the promotion of nuclear safety and security in the Asia-Pacific. They also proposed recommendations that can be considered by national governments and regional institutions such as the ASEAN Network of Regulatory Bodies on Atomic Energy (ASEANTOM) in enhancing nuclear governance regime in the region. 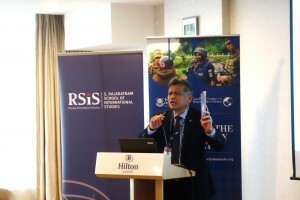 On the 15 February 2017 the Centre for Non-Traditional Security Studies (NTS Centre) at RSIS hosted a workshop on “Assessing the Technological Turn in Humanitarian Action” with the aim to bring together experts and practitioners that are concerned with the question of how technological innovations can assist and have impacted humanitarian action and disaster risk management in the Asia-Pacific region. The workshop featured 9 speakers from Australia, Indonesia, Korea, Philippines, the UK, the US, Spain and Switzerland and a total of 30 participants from multilateral organizations, government institutions and academia. Technologies that were discussed included disaster robotics for search & rescue operations, drones for mapping and the transportation of medical payload, big data and its use for development, renewable energy and humanitarian assistance, and remote sensing for early warning systems regarding floods and tsunamis. The workshop was the first event on humanitarian technology organized by NTS Centre’s Humanitarian Assistance and Disaster Relief Programme (HADR) and was deemed a success as it enabled a vivid exchange of knowledge, ideas and opinions among leading actors of the region involved in humanitarian technology. 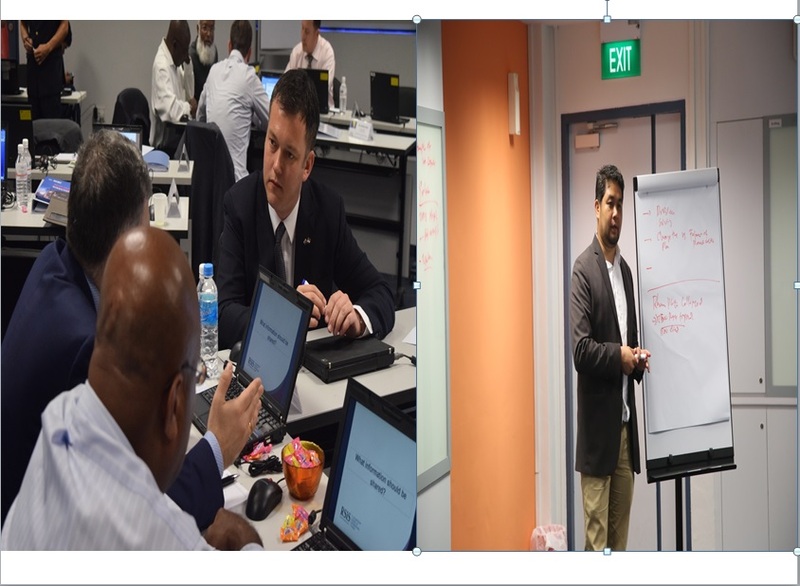 The first Exercise Coordinated Response (EXCOORES 17) was held from 23rd to 25th January at the Changi C2 Centre in Singapore. 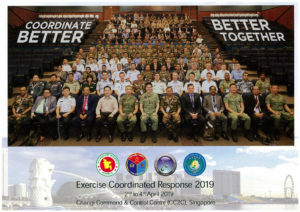 The multilateral exercise included military participants from 18 countries including Australia, Bangladesh, Brunei Darussalam, Canada, Cambodia, China, France, Republic of Korea, Laos, Malaysia, New Zealand, Philippines, Russia, Singapore, Thailand, USA, UK and Vietnam. The exercise also engaged partners including the ASEAN Centre of Military Medicine, Corporate Citizen Foundation, Earth Observatory of Singapore, International Federation of Red Cross and Red Crescent, Medicins sans Frontieres, S. Rajaratnam School of International Studies, Singapore Civil Defence Force, Singapore Red Cross, UN OCHA, UK Department of International Development, USAID, and World Food Programme. Dr Alistair D. B. Cook, Coordinator of the Humanitarian Assistance and Disaster Relief Programme and Research Fellow, NTS Centre and Mr Ennio V. Picucci, Research Associate observed the exercise. Major General Muniruzzaman, Visiting Senior Fellow with the Humanitarian Assistance and Disaster Relief (HADR) Programme, Centre for Non-Traditional Security Studies (NTS Centre) at the S. Rajaratnam School of International Studies, and President and CEO of the Bangladesh Institute of Peace and Security Studies (BIPSS) gave a seminar titled “The Digital Age of Humanitarian Aid– Harnessing the Power of Technology for HADR Operations” on 19 January 2017. MG Muniruzzaman began the seminar by highlighting the digital revolution as a potent tool that can transform the way we respond to disasters. 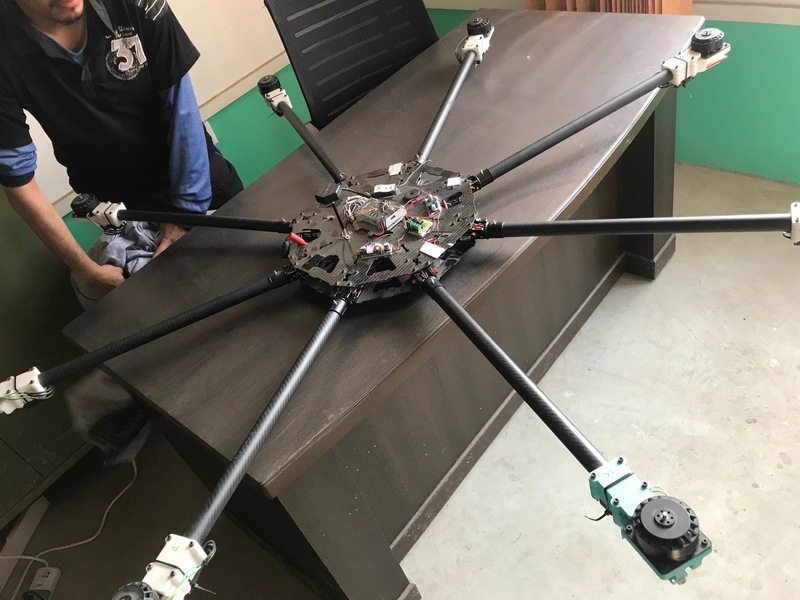 From earthquakes to typhoons or the recent flash flood in India, a range of new age apparatus can help national and international actors respond faster and more efficiently to these disasters. 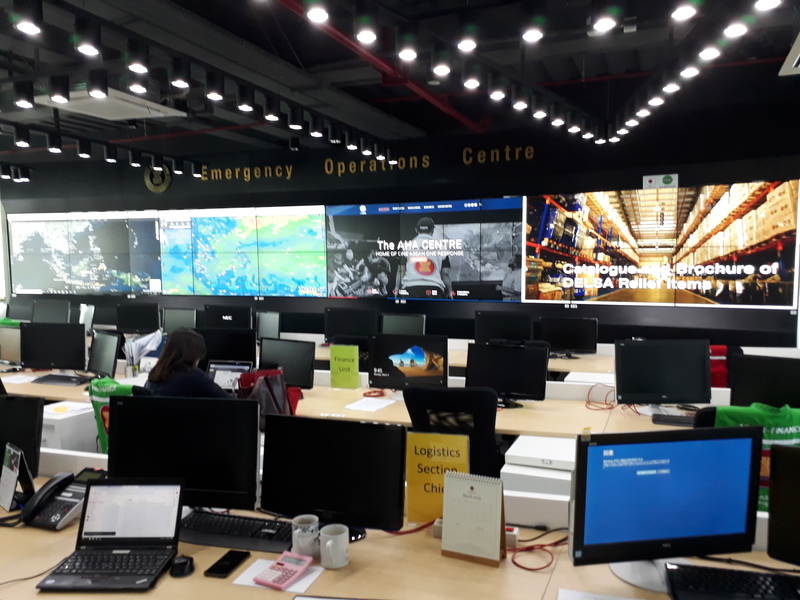 The seminar explored how new information-tracking, communication-tracking and mapping technologies can be practically used to respond to disasters, augment situational awareness, improve relief coordination, target and monitor vulnerable group and much more. For example, harnessing the power of technology can not only enhance early warning systems as a first step to prepare for an impending disaster, but also assist in deploying a rescue operation during a disaster with greater coordination and awareness. Utilizing modern technology and tools tailored for Humanitarian Assistance and Disaster Relief (HADR) will facilitate summoning remote support during a disaster. If an earthquake strikes, its effects in most parts of a country may be unknown in the capital or to external actors, and this is where drones can step in to carry out quick reconnaissance in areas that are difficult to reach, allowing manned helicopters and ground operations to continue with rescue missions with greater situational awareness. Using the 2015 Nepal earthquake as an example, MG Muniruzzaman noted the positive use of technology during the response and how unmanned aerial vehicles or drones played an important role. Other tools also helped to spread vast information among affected groups. The seminar ended noting the limitless possibilities that technology provides, and that there are a lot more sectors where new technology can be discovered, and sectors where existing technology can be improved. Some examples included strengthening first responders’ capabilities with a life suit exoskeleton, pre-disaster alerting notifications, portable telecommunications towers, and advancing wearable technology. Major General Muniruzzaman, Visiting Senior Fellow with the Humanitarian Assistance and Disaster Relief (HADR) Programme, Centre for Non-Traditional Security Studies (NTS Centre) at the S. Rajaratnam School of International Studies, and President and CEO of the Bangladesh Institute of Peace and Security Studies (BIPSS) gave a seminar titled “Soldiers as Humanitarians – The Role of the Military in HADR Operations” on 17 January 2017. MG Muniruzzaman began the seminar by highlighting the trend that saw soldiers being increasingly called on to respond to humanitarian operations, and that in HADR operations, soldiers were involved in several phases including immediate response and recovery. He spoke about why military should be involved in HADR operations, and highlighted several reasons as to why military had an advantage in responding to humanitarian emergencies. These included militaries having the best equipment that a state can provide during humanitarian response and military personnel who are well-trained for emergencies. He highlighted the paradox that soldiers are primarily trained to kill, but in HADR situations, the solder is best trained to save lives. MG Muniruzzaman elaborated on the guiding principles that military operate by, such as rapid response, judicious and economic use of resources, coordination between groups, the integration of assets and the synchronization of actions. Militaries have command and control structures, and this must be coordinated with other organisations on the ground since military structures are very linear. He noted some of the problems militaries face in responding to HADR situations, such as the need for speed in the initial disaster response phase, difficulties in distribution of resources due to inaccessible environments, and the scale of the disaster. Looking at possible future scenarios of HADR operations, he noted the increasing importance of GIS and mapping technologies, drones and robots. Using the Haiti earthquake as an example, he emphasized the need for humanitarian actors and military to interact well given the complexity of HADR operations. He concluded by noting the military’s main aim which is to protect and serve the nation, including serving the people when in crisis. The seminar concluded with recommendations for the role of the military in HADR operations, such as the need to update and adapt constantly, the move towards smart operations, greater operational integration, and to adapt technology to changing needs. RSIS hosted the Asia-Pacific Leadership Network (APLN) for Nuclear Non-Proliferation and Disarmament Southeast Asian Sub-regional Meeting at the Orchard Hotel in Singapore from 8 to 9 December 2016. 20 participants from Southeast Asia and beyond discussed the regional perspectives and priorities for nuclear non-proliferation, the status of the Southeast Asia Nuclear Weapon Free Zone Treaty and its Protocol, and the implications of peaceful use of nuclear energy in Southeast Asia. Participants proposed policy recommendations on strengthening nuclear energy cooperation and governance in the region. Singapore’s Ambassador-at-Large Bilahari Kausikan had an informal discussion with the participants on relevant issues concerning nuclear safety, security and safeguards in the region. 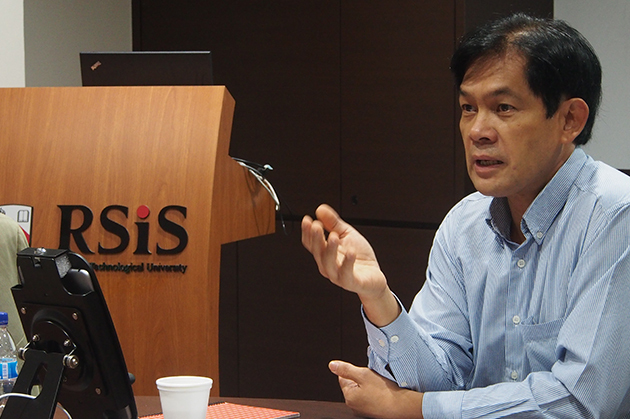 Dr Sorpong Peou, visiting Senior Fellow with the Humanitarian Assistance and Disaster Relief (HADR) Programme, Centre for Non-Traditional Security Studies (NTS Centre) at the S. Rajaratnam School of International Studies, and a Professor in the Department of Politics and Public Administration at Ryerson University and a member of the Yeates School of Graduate Studies gave a seminar titled “Human Security through Formal Trials?” on 1 December 2016. In this second seminar, Dr Peou addressed human security using the lens of global legalism, specifically through the use of formal trials for addressing humanity’s worst crimes, such as the crimes of genocide, crimes against humanity, ethnic cleansing and war crimes. Describing the increase in the use of formal trials as a means of accountability for conflict and human rights abuse since the 1990s, and the emergence of international criminal tribunals and ad hoc tribunals, Dr Peou highlighted the normative basis of global legalism, and unacceptability of some things, such as serious crimes. This proposition rests on the assumption that the threat of judicial punishment through formal trials can help to deter and even end armed conflict and serious crimes because perpetrators are rational actors, but argued against the notion that such judicial punishment would help transform post-conflict societies into peaceful democratic societies based on the rule of law. Using the examples of the Extraordinary Chambers in the Courts of Cambodia and the Special Panels for Serious Crimes in East Timor, Dr Peou argued that there is little evidence to suggest that such formal trials produce these positive effects. Dr Peou also addressed the role of formal trials in the retributive justice framework and the differences between retributive justice and restorative justice. 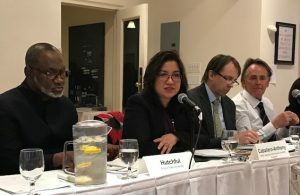 He highlighted the limitations of the approach to, or use of, formal trials in situations where it might be inappropriate, and how cultural appropriateness needs to be given consideration in certain situations and countries, to avoid formal trials being seen as an imposition of a western form of justice. This tied into notions of justice and the inherent tension between peace and justice, and how focusing on justice might not necessarily lead to peace. Dr Peou argued against the importance of formal trials in leading to democratization and highlighted that formal trials did not necessarily lead to democratization. Dr Sorpong Peou, visiting Senior Fellow with the Humanitarian Assistance and Disaster Relief (HADR) Programme, Centre for Non-Traditional Security Studies (NTS Centre) at the S. Rajaratnam School of International Studies, and a Professor in the Department of Politics and Public Administration at Ryerson University and a member of the Yeates School of Graduate Studies gave a seminar titled “Human Security: An Evolving and Contested Concept” on 29 November 2016. In the first of two seminars, Dr Peou introduced the highly contested concept of human security, noting that individuals were the reference point for human security instead of the more commonly known state-centric view of security. Noting the difficulty in defining human security, Dr Peou referenced the development-based approach articulated by the United Nations Development Program, and how such an approach poses a challenge to other concepts of security, such as national security, collective security, common security and comprehensive security. Dr Peou framed human security as the freedom from suffering and fear and as being obtained through forming groups, states, and protection mechanisms. He also noted that global legalism is one of the pillars of human security, and the legal protection of human security through, for example, international legal bodies and tribunals, which he further elaborated on in his second seminar. Dr Peou also discussed human security’s relationship with the responsibility to protect, and how human security has often been seen as the responsibility to protect. He noted that this responsibility to protect leads to the responsibility to rebuild but that the threat of use of force is contested and had not been applied systematically, highlighting the need for a greater focus on prevention. Dr Peou argued that the development-based approach is inadequate in promoting human security, and highlighted the importance of protecting people against physical violence, in the forms of armed conflict and most serious crimes for example, and natural disasters. 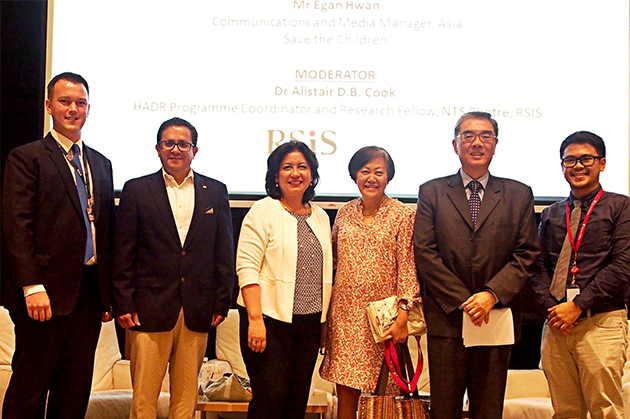 Mely Caballero Anthony, Head of the NTS Centre with Said Faisal, Executive Director of the ASEAN Coordinating Centre for Humanitarian Assistance and guest speakers at the RSIS – AHA Centre Policy Discussion on the World Humanitarian Summit Implications for Asia Pacific. 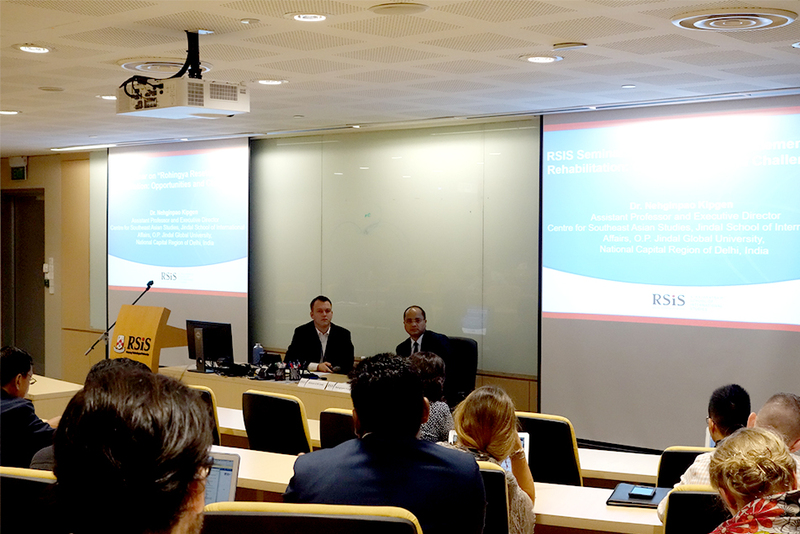 The S. Rajaratnam School of International Studies (RSIS), jointly with the Asia-Pacific Centre for the Responsibility to Protect (APR2P), organised a public seminar on 7 November 2016. The guest speaker was Dr Surin Pitsuwan, ASEAN Secretary-General from 2008 to 2012. 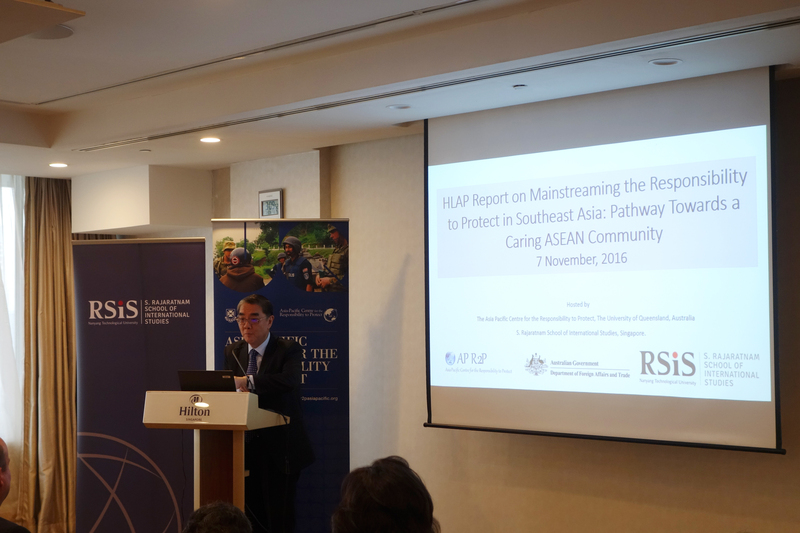 The title of his speech was ‘High-Level Advisory Panel’s (HLAP) Report on Mainstreaming the Responsibility to Protect (RtoP) in Southeast Asia: Pathway Towards a Caring ASEAN Community’. 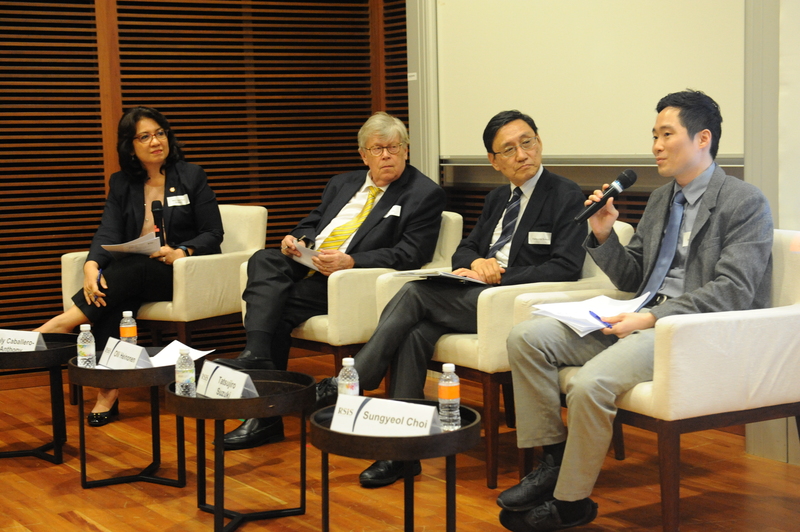 Ambassador Ong Keng Yong, Executive Deputy Chairman of RSIS, moderated the seminar. 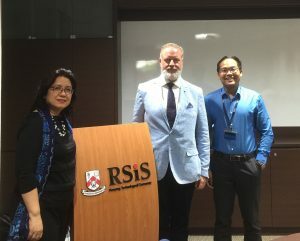 Associate Professor Mely Caballero-Anthony, Head of RSIS Centre for Non-Traditional Security (NTS) Studies, Professor Alex Bellamy, Director of APR2P, and Mr. Philip Green, Australia’s High Commissioner to Singapore, gave opening and welcoming remarks. The High-Level Advisory Panel on the Responsibility to Protect in Southeast Asia was established by Dr Pitsuwan in 2013, at the behest of Mr. Adama Dieng, the UN Secretary General’s Special Adviser on the Prevention of Genocide. 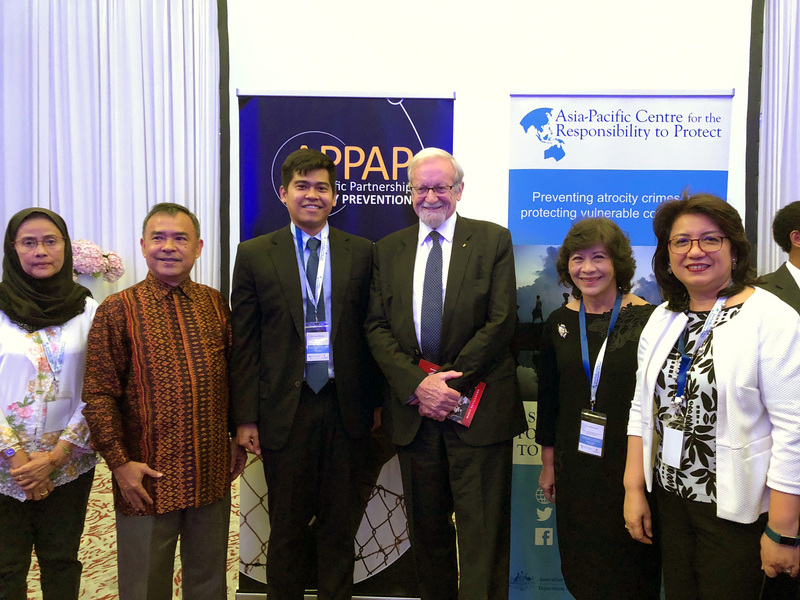 The HLAP comprised five eminent persons from Southeast Asia, with Associate Professor Caballero-Anthony and Professor Bellamy as the Secretariat. The HLAP Report was launched in September 2014 in New York and was received by Mr. Dieng and Dr Jennifer Welsh, the UN Secretary General’s Special Adviser on RtoP. 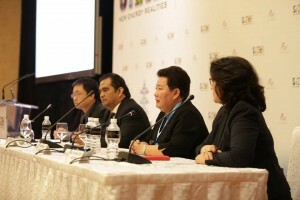 The Report outlined recommendations on how ASEAN can promote RtoP. 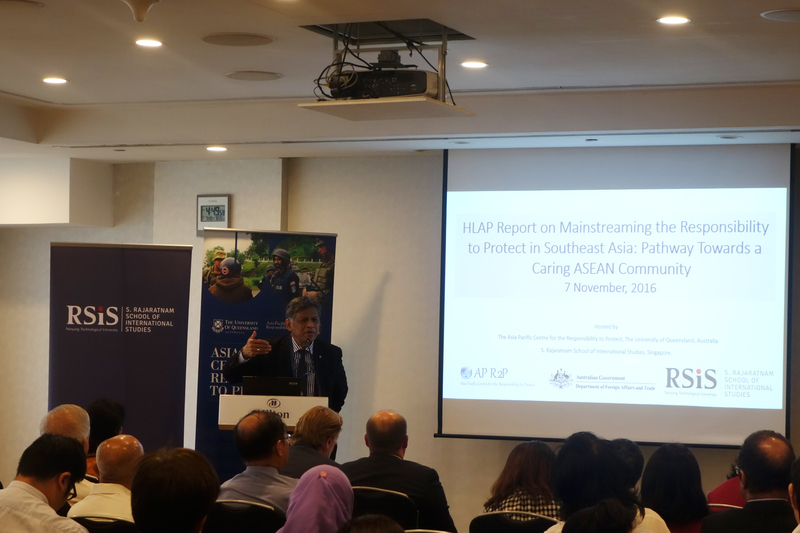 This seminar is part of the outreach activities to disseminate the findings and recommendations of the HLAP Report in the Southeast Asia. The S Rajaratnam School of International Studies, in collaboration with the Energy Market Authority, organised a roundtable on “Nuclear Safety and Cooperation in ASEAN” at the Singapore International Energy Week (SIEW) on 28 October 2016. Roundtable panellists included Dr Olli Heinonen, RSIS S Rajaratnam Professor of Strategic Studies and Senior Associate at Belfer Centre for Science and International Affairs of Harvard University; Dr Tatsujiro Suzuki, Vice Director and Professor, Research Centre for Nuclear Weapons Abolition, Nagasaki University (RECNA); Mr Shah Nawaz Ahmad, Senior Adviser, World Nuclear Association; Dr Hoang Sy Than, Deputy Director of the Department of R&D Management, Vietnam Atomic Energy Insitute (VINATOM); Mr Sabar Md Hashim, Special Officer, Economic Planning Unit, Prime Minister’s Department of Malaysia; and Ms Siriratana Biramontri, Special Consultant, Office of Atoms for Peace, Thailand and former chair of ASEAN Network of Regulatory Bodies on Atomic Energy (ASEANTOM). 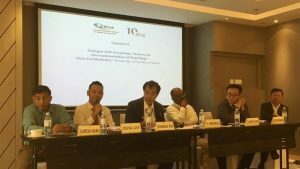 The roundtable discussed the post-Fukushima nuclear safety and emergency preparedness in the Asia Pacific and examined the growing regional cooperation on nuclear energy governance in Southeast Asia. While thirty countries currently use nuclear power, about the equivalent number of newcomer states are considering, planning or actively working to include it in their energy mix. Asia has been recently driving the growth of the nuclear power industry with China, India, Pakistan and South Korea building new nuclear reactors. In Southeast Asia, Vietnam is scheduled to open its first nuclear power plant by 2028 while Thailand, Malaysia and Indonesia are carefully studying the nuclear option. In this regard, regional issues and cooperation on nuclear safety and security as well as nuclear emergency preparedness and response need to be examined. The lessons of the Fukushima nuclear accident were revisited with special focus on new measures to enhance nuclear safety and emergency preparedness and response. Panellists reiterated that each state operating nuclear power is responsible for nuclear safety and hence needs to be prepared for radiological accidents and emergencies. 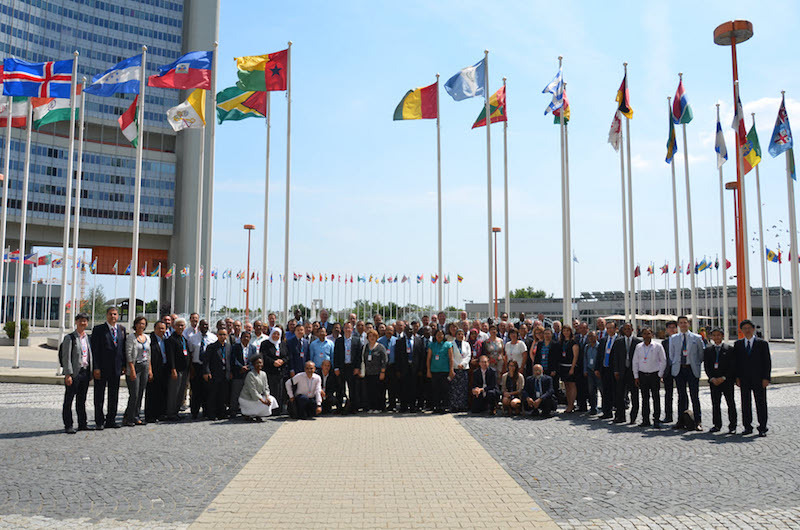 But as the consequences – radiological and beyond – is trans-boundary in effect, all states have a role to play in preparation of contingency plans and develop a cooperative approach to a chain of emergency, response and recovery activities. It was emphasised that the Fukushima accident still lingers and entails not only technical dimensions but also environmental and socio-political implications for the Japanese public. For instance, the Japanese government still needs to negotiate with the Japanese public, specifically affected local communities, as to where to dispose the decontaminated soil and water. The evacuation of Fukushima residents also involves long-term social and psychological impact on them, with implications on local politics, highlighting the need to analyse the nuclear accident from the social science perspective. But from the technical perspective of the nuclear industry, nuclear safety has been vastly improved since the Fukushima accident. Nuclear power is now the most regulated energy industry in the world with more stringent post-Fukushima safety standards. Serious nuclear accidents are very rare and nuclear energy has caused fewer deaths than any other major form of electricity generation. The panellist from the nuclear industry further claimed that the Fukushima accident is not expected to have any radiation-related public health impact. Even clean-up workers are unlikely to suffer any long-term health effects due to radiation. However, despite the improvements that have been made on nuclear safety, there are still major issues that remain unresolved for nuclear energy. The compensation scheme for affected communities would definitely boost the cost of nuclear power generation; the disposal of high-level waste remains unaddressed; and more importantly, governments still need to develop and implement effective public consultation and communication strategies to address public opinion against nuclear power and concerns over the safety and security of nuclear power. In Japan for instance, 70.8 percent of the public opposed the re-opening of the country’s NPPs while 52.3 percent believed that NPPs are not safe. Meanwhile, in Southeast Asia, panellists claimed that public acceptance is extremely needed before making a national decision on NPP construction. In this regard, ASEAN countries interested in using nuclear power such as Vietnam are using various public communication strategies such as information centres, public seminars and community engagements to allay the fears of the local communities. 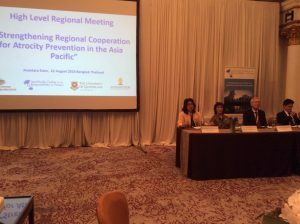 Panellists also deliberated on the importance of regional cooperation and the role of regional networks such as ASEANTOM in strengthening nuclear safety cooperation and emergency preparedness and response in Southeast Asia. Nuclear safety and radiological emergency are indeed regional issues that entail regional responses. Nuclear incidents can range from accidents with localised radiological impact to large-scale nuclear terrorist attacks or nuclear disasters with transnational spillovers. There are vehicles to share best practices, know-how and resources through the IAEA, and, in particular, within the ASEAN framework. The ASEANTOM was recently given political recognition when it was designated as an ASEAN body under the ASEAN Political-Security Community Pillar in Annex 1 of the ASEAN Charter. ASEANTOM has been conducting nuclear security border exercises, co-hosted by Thailand and Malaysia, and implementing projects on joint emergency preparedness and response with the assistance of the IAEA and the European Commission. Vietnam also proposed the establishment of the ASEAN Network on Nuclear Power Safety Research that will promote research collaboration and sharing of knowledge and best practices on nuclear safety among nuclear research institutions, universities, and think-tanks of ASEAN member-states. With the increasing interest in nuclear power in the region, panellists stressed the importance of building capacity in the region to allow member-states to make use of technologies that will facilitate the implementation of nuclear projects in a safe and sustainable manner. 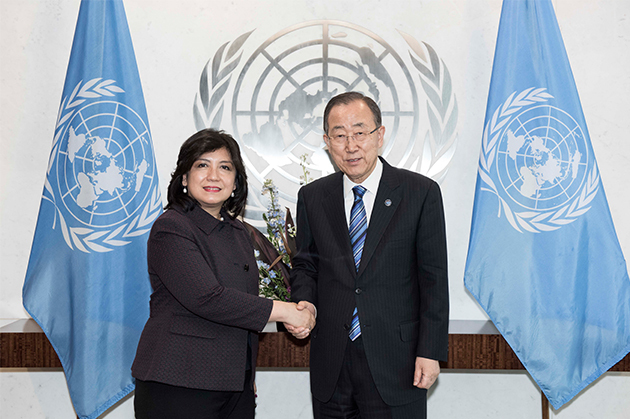 Secretary-General Ban Ki-moon (right) meets with Mely Caballero Anthony, Chair of the Advisory Board on Disarmament. Prof. Anthony attended the First Committee Meeting of the UN as Chair of the UN Secretary General’s Advisory Board on Disarmament Matters (ABDM), 24 October 2016, New York. 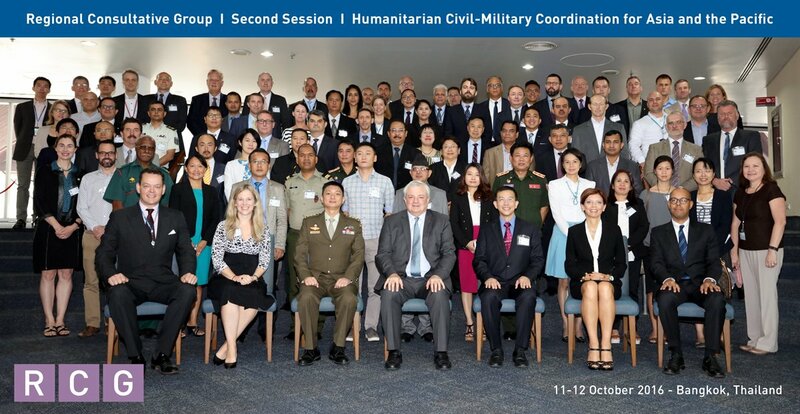 Alistair D. B. Cook, Coordinator of the Humanitarian Assistance and Disaster Relief [HADR] Programme, attended the Second Session of the Regional Consultative Group (RCG) which took place on 11-12 October 2016 at the United Nations Building, Rajadamnern Avenue, Bangkok, Thailand. c) strengthen linkages with other relevant forums with an emphasis on the relationship with Regional Organizations and the Global Consultative Group on Humanitarian Civil-Military Coordination. Dr Rahmawati (AMA) Husein, visiting fellow with the Humanitarian Assistance and Disaster Relief Programme (HADR), Centre for Non-Traditional Security Studies (NTS Centre) gave a RSIS seminar titled “Preparing to Excel in Emergency Response [PEER]:Local Faith Capacity Building for Emergency Response” on 6th October 2016. Speaking in the context and example of Indonesia, Dr Husien highlighted the high incidence and prevalence of disasters and natural hazards in the country and the role which faith-based organisations (FBOs), like the Muhammadiyah organization, have played in emergency response. 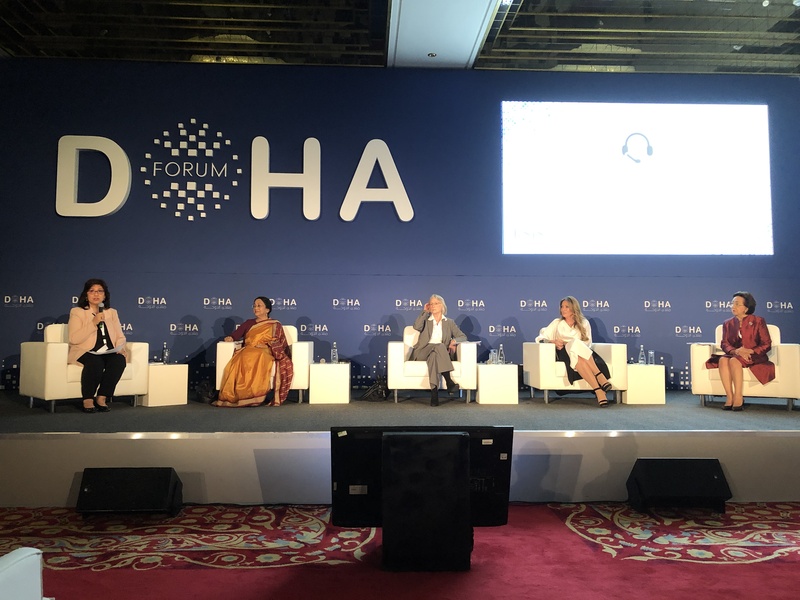 Though often side-lined or relegated to the fringes of the global humanitarian architecture, Dr Husien highlighted how in many a occasion FBOs are able to better respond and even fill critical gaps and aspects of disaster response and relief. Some of these advantages include being part of the affected community on the local level, hence being able to better understand the context and ensure better continuity in terms of not just immediate response but also the process of rehabilitation and reconstruction; greater trust from the community as compared to external parties (state or NGOs) who might be responding; as well as better and stronger networks and resources (physical and human) at the local level. 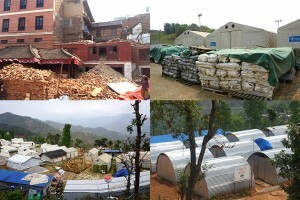 Other important, and often less prioritised, issues which FBOs also significantly help comes in the form of providing the psycho-social support for affected communities and populations, and the existence of formalised organisational structure which can see the recovery phase through and unlike other external responders not have the problems of an exit strategy, which in many occasions has proved to be problematic for many humanitarian organisations. Some challenges do remain however. Ensuring the highest level of professionalism and appropriate skills like needs and services assessments on the ground, as well as management of resources and finances in immediate post disaster phase are some of these. Others like institutionalising SOPs, guidelines, and regulations for responders in what are essentially volunteer based and driven organisations have also proved to be daunting. Despite some capacity challenges of FBOs however, it is going to be increasingly important to bring these institutions into the larger HADR fold and architecture. As part of the local community and often times with longer history of engagement with the populations than even the State, FBOs are not only instrumental in response but also in terms of recovery and long-term well-being of affected communities. 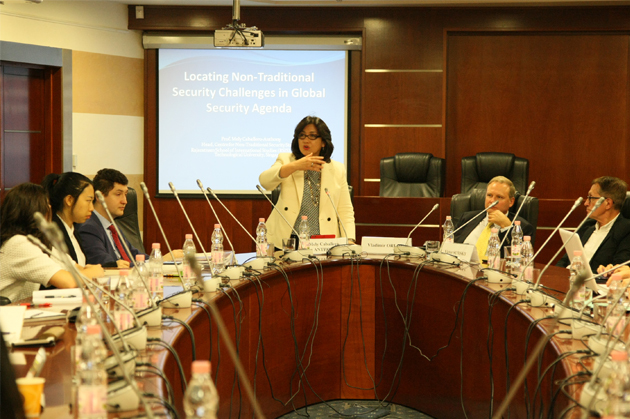 Head of NTS Centre, A/P Mely Caballero-Anthony delivering a Special Lecture on “Locating Non-Traditional Security in Global Security Agenda” to students and faculty at the School of International Relations, MGIMO-University, Russia on 28 September 2016. 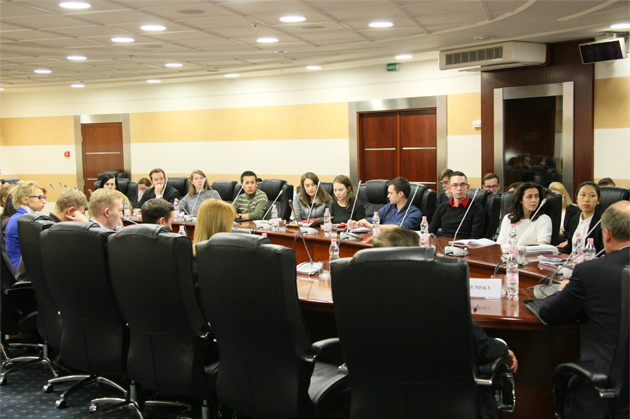 Students listening to Prof Caballero-Anthony’s NTS lecture at the MGIMO-University, Russia, 28 September 2016. 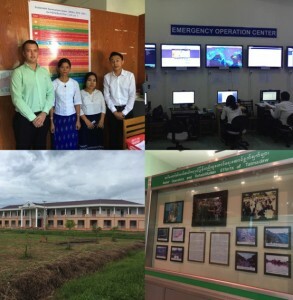 Clockwise from top left: Meeting with Ministry of Social Welfare, Relief and Resettlement; Emergency Operation Center; Defence Services Museum; and Disaster Management Training Centre. Dr Alistair Cook and Mr Zin Bo Htet travelled to Yangon, Nay Pyi Taw and Pathein between 30 September 2016 and 9 October 2016 to conduct field interviews with various government and non-government officials to better understand the role of the government, international organisations and NGOs in delivering Humanitarian Assistance and Disaster Relief to disaster-prone communities in Myanmar. The fieldwork was part of the HADR Programme’s research on Humanitarian Assistance and Disaster Relief (HADR) Frameworks in Asia Pacific. 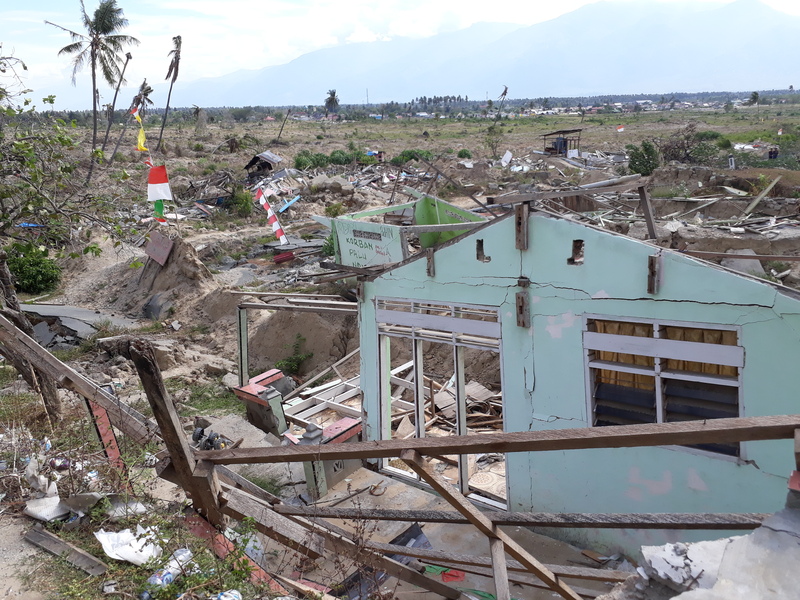 The research aims to put together the lessons learnt by the relevant government agencies and NGOs from the issues and challenges that emerged since Cyclone Nargis to the present. The research investigates the current status and history behind policy responses and structural reforms to HADR operations in Myanmar. 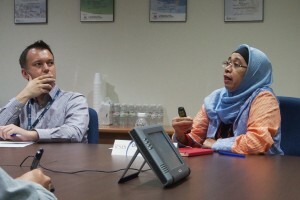 On September 29, Dr. Rahmawati Husein, RSIS Visiting Fellow at the Humanitarian Assistance and Disaster Relief (HADR) program at the NTS Centre, gave a talk titled ‘An Assessment of the Hospital Preparedness and Community Readiness for Emergency and Disaster [HPCRED] Approach.’ Dr. Husein is the Vice Chair of the Muhammadiyah Disaster Management Center and an Assistant Professor in the Jusuf Kalla School of Government at Universitas Muhammadiyah Yogyakarta (UMY). Dr. Alistair Cook, coordinator of the HADR program, chaired the seminar. Dr. Husein explained the centrality of strengthening health system capacity for disaster reduction and relief. Physical damage to hospitals and lack of surge capacity during disasters exacerbate the human toll. To address this issue, the Comprehensive Safe Hospital Framework was released by the WHO in Sendai last year at the World Conference for Disaster Risk Reduction. She presented a new perspective that adds a key element to the framework: the role of community involvement and engagement in supporting hospitals. The idea is to encourage active community participation in the hospital’s disaster contingency plans. This plays an important role in risk reduction during disasters. Muhammadiyah, a non-profit faith-based organization, has developed community engagement and readiness programs to enhance hospital preparedness at 9 sites in Indonesia. 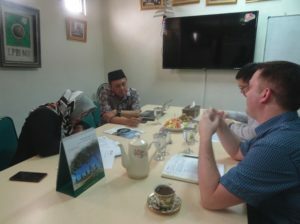 These Muhammadiyah hospitals collaborate with district officials, community leaders, NGOs, and local medical colleges to implement the ‘Safe Hospital’ program. Dr. Husein also reported the progress made in Indonesia in implementing ‘Safe Hospital’ programs. She highlighted some of the challenges that impede the improvement of hospital preparedness in Indonesia. There is a lack of standardization in health services; the monitoring and evaluation standards are not very strict. Moreover, the ‘Safe Hospital’ programs do not have legal mandate. In terms of local community engagement, identifying the relevant actors and building positive relationships takes time. The Humanitarian Assistance and Disaster Relief Programme (HADR) at the NTS Centre organized a seminar titled ‘Commentaries to the Geneva Conventions: An Updated Interpretation for Contemporary Humanitarian Challenges’ in collaboration with the International Committee of the Red Cross (ICRC). The event was held at the KeyPoint on Wednesday, 21 September 2016 with Ms Kelisiana Thynne, Regional Legal Advisor for South East Asia and Ms Fiona Barnaby, Legal Adviser, International Humanitarian Law Department, ICRC, Kuala Lumpur as the speakers and Dr Alistair D. B. Cook as the discussant. The seminar was moderated by Associate Professor Mely Caballero-Anthony, Head of Centre for Non-Traditional Security Studies. The speakers provided a brief historical background on the Commentaries to the Geneva Conventions. Subsequently, they explained on their current project to re-interpret and update the Geneva Conventions of 1949 and their Additional Protocols of 1977 in the form of commentaries, based on the current geopolitical situation. The updated Commentary to the First Geneva Convention was launched on 22 March 2016. The First Geneva Convention, which is a foundational text for international humanitarian law (IHL) provides for the protection of the wounded and sick; the dead; medical personnel, facilities and transport; and the distinctive emblems of the Red Cross and Red Crescent. The speakers, Ms Thynne and Ms Barnaby discussed about the newly emerging actors in modern warfare and the difficulties in implementing IHL as a result of changes. It also highlighted the impact of technological advancements in IHL and in improving medical operations in times of crises. The discussant, Dr Cook, wrapped up the seminar by addressing the contribution of the commentaries to the interpretation of IHL and what it means to Singapore and the ASEAN region. 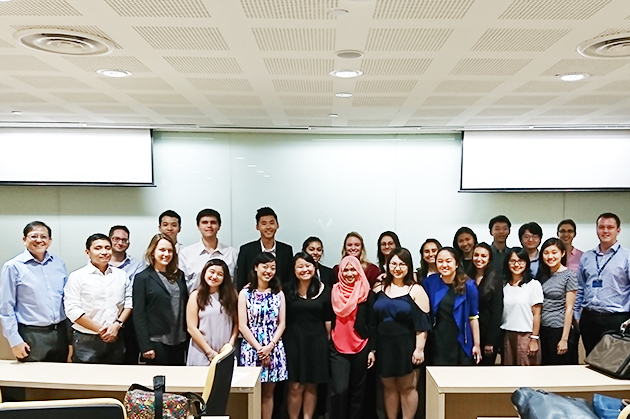 The seminar was well-received by the audience who were mainly students currently pursuing their Master of Science in RSIS. RSIS and Pacific Forum-CSIS co-organised the Nuclear Energy Experts Group Meeting in Singapore from 19 to 20 September 2016. 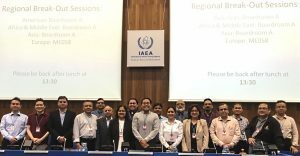 40 nuclear experts from Asia-Pacific countries deliberated on the Nuclear Security Summit process, nuclear security governance in Asia, the nuclear safety regime in Asia, radioactive waste management, and ways to respond to nuclear accidents and incidents. Mr Julius Cesar Trajano, RSIS Associate Research Fellow, made a presentation on nuclear safety cooperation in ASEAN while Dr Alistair DB Cook, RSIS Research Fellow, discussed the regional cooperation on nuclear emergency preparedness and response in ASEAN. On the evening of 18th August, the S. Rajaratnam School of International Studies marked World Humanitarian Day. The Humanitarian Assistance and Disaster Relief (HADR) Programme brought together practitioners, policy professionals, the research community and the wider public by organizing an exhibition, panel discussion and networking session to celebrate those who dedicate their lives to humanitarian work at the Park Royal Hotel on Beach road. Associate Professor Mely Caballero-Anthony, Head of Centre for Non-Traditional Security Studies (NTS Centre), welcomed more than 70 participants to the event from across the community. The three panellists were Ms Janet Lim, Former UNHCR Assistant High Commissioner for Operations, Mr Xavier Castellanos, Asia Pacific Regional Director of International Federation of Red Cross and Red Crescent Societies (IFRC), and Mr Egan Hwan, Communications and Media Manager, Asia, Save the Children. The panel was moderated by Dr Alistair D. B. Cook, Coordinator of the HADR Programme. At the exhibition and networking session, Badan Agama Dan Pelajaran Radin Mas (BAPA), Earth Observatory of Singapore, International Committee of the Red Cross (ICRC), Mercy Relief, Save The Children, Singapore Red Cross, United Nations High Commissioner for Refugees (UNHCR), Humanitarian Assistance and Disaster Relief Programme (RSIS), and World Vision presented their research and field activities, shared their experiences and answered questions to an inquisitive crowd. 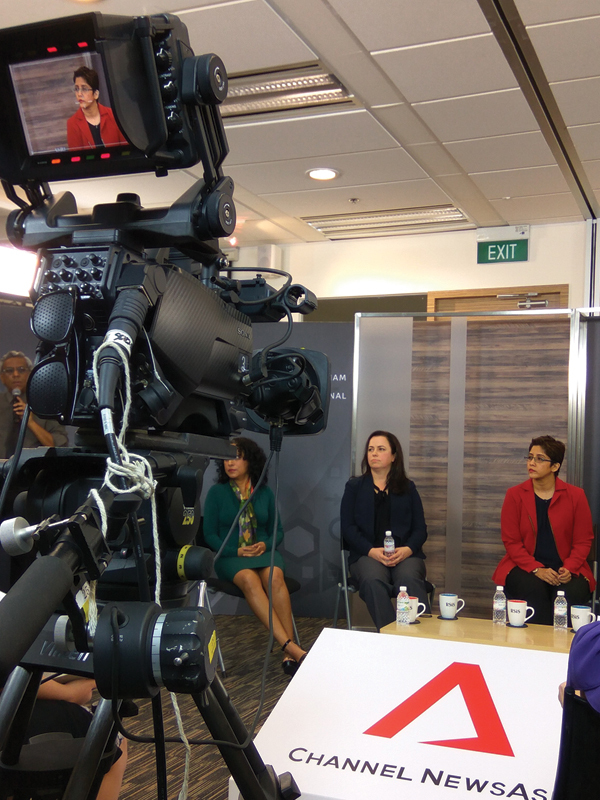 Dr Tamara Nair was part of the panel in the second episode of the RSIS-CNA ‘Think Tank’ Series: ‘Do We Have Enough to Eat? Food Security in Asia’. 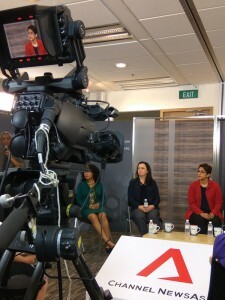 The episode discussed access and availability of food in Asia, as well as the problems of hunger and obesity. The programme airs on Channel News Asia on 17th August 2016 at 8pm. Dr Tamara Nair is a Research Fellow at the NTS Centre and is also the coordinator of the centre’s Food Security Programme. RSIS-led information sharing platform for engagement on current research and potential collaborative opportunities. UN Secretary-General H.E. 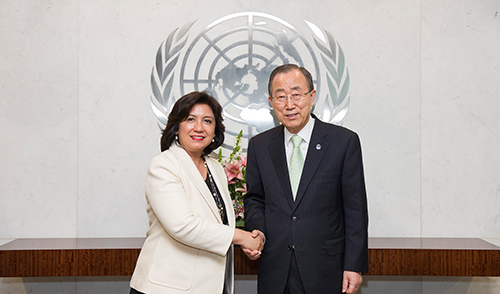 Mr Ban Ki-Moon with A/P Mely Caballero-Anthony, Chairperson of the 66th Session of the UN Secretary General’s Advisory Board on Disarmament Matter, held at the UN Headquarters in New York on 28 June-1 July 2016. Members of the UN Secretary General’s Advisory Board on Disarmament Matters (ABDM) at the recently concluded 66th Session of the ABDM. Prof. Caballero-Anthony is the current Chair of the ABDM and among the key issues discussed by the Board is the relationship between sustainable development, security and arms control. 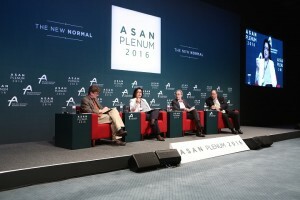 Head of RSIS NTS Centre, Assoc Prof Mely Caballero-Anthony, speaking at a panel on Non-Traditional Insecurity at the 2016 ASAN Plenum, held on 15-17 April 2016 in Seoul, Korea. Organised around the theme, “New Normal”, the ASAN 2016 Plenum was organised by the ASAN Institute. Joining Assoc Prof Anthony in panel are: from left, Martin Fackler, Rebuild Japan Initiative Foundation; Yves Doutriaux, Council of State, France; and Robert Manning, Atlantic Council. 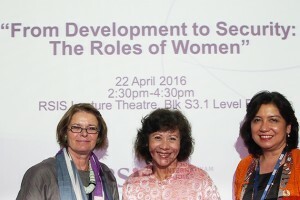 The seminar, “From Development to Security: The Roles of Women,” was a conversation between Dr Chantal de Jonge Oudraat, President of Women In International Security (WIIS), Visiting Senior Fellow at RSIS and Dr Noeleen Heyzer, RSIS Distinguished Visiting Fellow and a former UN Under-Secretary-General. The speakers noted that the UN Security Council Resolution 1325 has become a tool with which women are able to organise and mobilise for the cause of women in conflict, post-conflict and humanitarian situations. Dr Heyzer shared the long road taken in getting it passed, from the UN General Assembly to the Security Council itself. She said that moving forward, security and development should go hand-in-hand as a whole-of-society approach towards the recognition of women’s rights. Dr de Jonge Oudraat stressed that international actors need to recognise the urgency of having more research initiatives on this topic, and to provide the necessary funding. 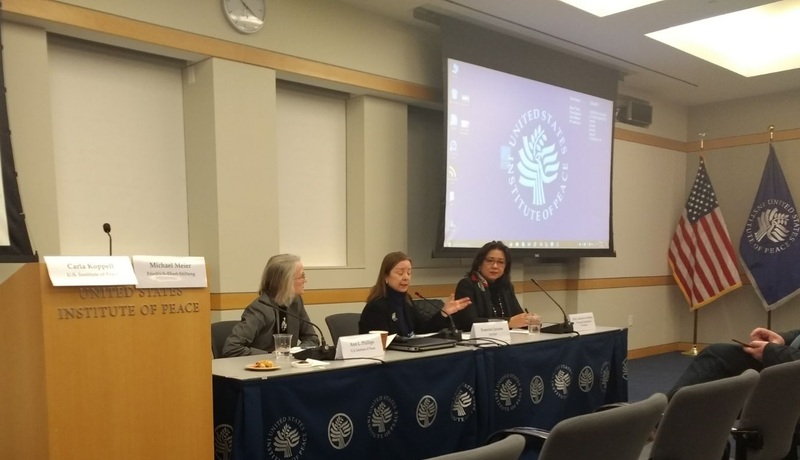 During the discussions moderated by Associate Professor Mely Caballero-Anthony, Head of the NTS Centre, speakers agreed that the WPS agenda is important across all countries, and raises the need for more accountability mechanisms to be put in place at both domestic and international levels. Institutions such as the RSIS have an important part to play in surfacing these important security issues as well. 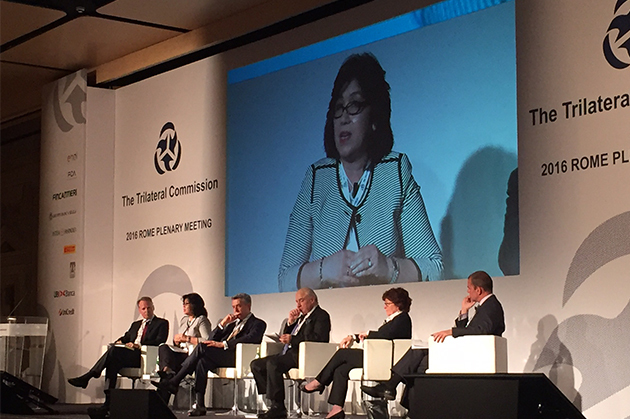 Head of Centre, A/P Mely Caballero-Anthony speaking at a panel on International Migration and Refugee Flows: Challenging the Globalisation of Indifference, organized by the Trilateral Commission on 15-17 April 2016, in Rome, Italy. Together in the panel are: Filippo Grandi (3rd from left), UN High Commissioner for Refugees, Peter Sutherland (4th from left), Special Representative of the UN Secretary General for Migration, Louise Arbour, (2nd for right), former United Nations High Commissioner for Human Rights, Khalid Koser (far right), Associate Fellow of Geneva Centre for Security Policy and David Dreier( far left), Distinguished Fellow, Brookings Institution. Dr Alistair Cook and Mr Maxim Shrestha travelled to Nepal between 25 March 2016 and 3 April 2016 to conduct field interviews with various government and non-government officials to better understand the international response and the aftermath of the 2015 Nepal Earthquakes. The fieldwork was part of the HADR Programme’s research on drawing out some of the lessons learnt for the international response community based on experience. 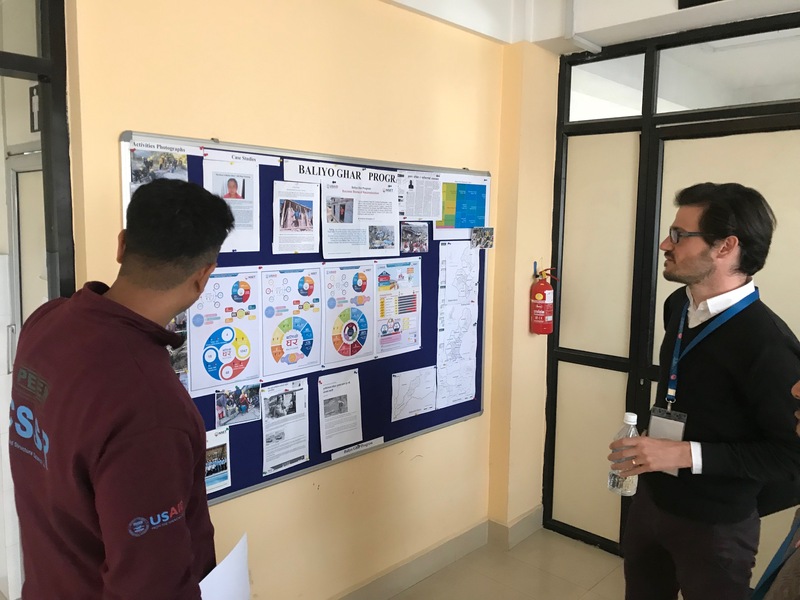 The research aims to put together some comprehensive and concrete lessons learnt after talking to both, the international responders as well as stakeholders and recipients of international relief and aid in Nepal. 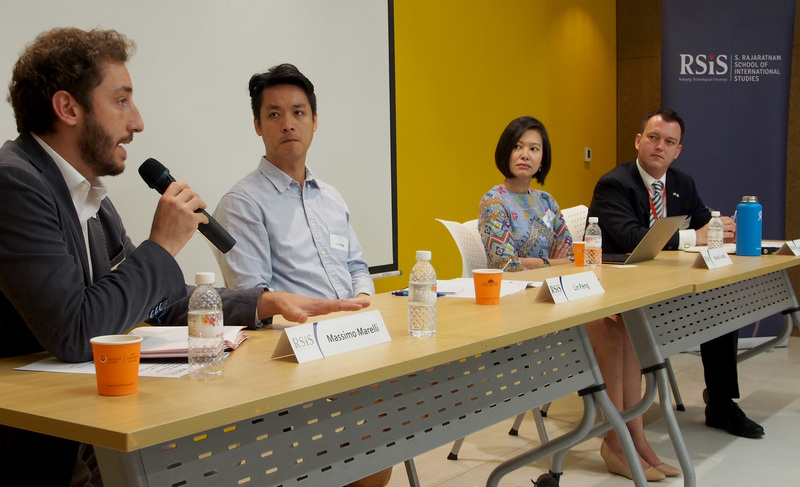 Dr Alistair Cook, Dr Tamara Nair, Mr Vincent Mack Zhi Wei and Mr Zin Bo Htet attended a closed-door engagement session for key stakeholders on trafficking in persons held at the National Volunteer & Philanthropy Centre (NVPC) in Singapore on 10 March 2016. The Singapore Inter-Agency Taskforce on Trafficking-in-Persons (TIP) launched a new National Approach against TIP at the engagement session. The session recapped on the National Plan of Action (NPA) to combat TIP and discussed on the way forward with the National Approach. The new National Approach for the next ten years will build on the success of the National Plan of Action (NPA) which had guided the Taskforce’s anti-TIP efforts from 2012 to 2015. Dr Alistair Cook, Research Fellow and Coordinator of the Humanitarian Assistance and Disaster Relief Programme, and Dr Jonatan Lassa, Research Fellow, attended the “RSIS-RHCC Professional Training Workshop on HADR” held at Changi Regional Humanitarian Command and Control Centre in Singapore on 16 February 2016. They conducted lectures on (1) Regional HADR Landscape and the Future Ahead; (2) Roles and Functions of Various Humanitarian Actors and Their Effectiveness; (3) Emerging Trends: Shifting Countries’ Policies on Accepting Foreign Military Assistance (FMA); and (4) Emerging Trends: New Technological Initiatives. About 60 to 80 participants from the Singapore Armed Forces attended the workshop. 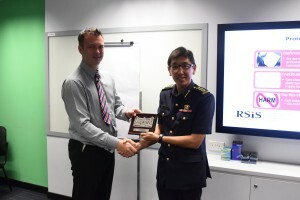 Dr Alistair Cook, Research Fellow and Coordinator of the Humanitarian Assistance and Disaster Relief Programme, and Dr Jonatan Lassa, Research Fellow, conducted lectures for the Leadership Training Programme in Disaster Management at the Command & Staff Training Centre, Civil Defence Academy in Singapore, 15-16 February 2016. Dr Cook’s lecture was on “The Future of HADR Landscape in the Asia-Pacific”, while Dr Lassa’s was on “Competent Crisis Leadership: How to avoid leadership crisis in times of disasters?” The training programme included participants from the Middle East, Europe, Central Asia, Africa, Southeast Asia and South Asia. NTS Centre organised a fieldwork trip to Kuala Lumpur on 20 January 2016. The purpose of the trip was to reach out to and build networks with potential disaster management partners, key regional stakeholders in the Humanitarian Assistance and Disaster Relief (HADR) field, and to understand more about the logistical processes and challenges involved in responding to crises in the region. 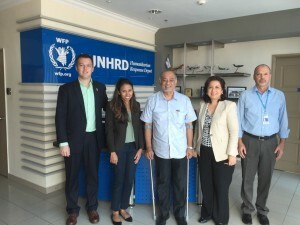 During the trip, Associate Professor Mely Caballero-Anthony, Head of NTS Centre, RSIS, Dr Alistair D. B. Cook, HADR Programme Coordinator, and Research Fellow, NTS Centre and Ms Vishalini Chandara Sagar, Senior Analyst, NTS Centre, visited Southeast Asia’s only UN Humanitarian Response Depot in Subang, Malaysia, to learn more about the role of the logistics base in disaster responses in the region. The visit was followed by meetings with the Office of the UN High Commissioner for Refugees (UNHCR) and the International Committee of the Red Cross, Kuala Lumpur, Malaysia. Dr Abdelmonem Daymi, Mr Salah Aboulgasem and Mr Adnan Hafiz of Islamic Relief Worldwide, Mr Haji Mohd Johan Bin Janif and Mr Mohamed Shah Reza of the Badan Agama & Pelajaran Radin Mas (BAPA) visited the Humanitarian Assistance and Disaster Relief Programme (HADR) at the NTS Centre on 19th January 2016. The visitors met with Dr Alistair D. B. Cook, NTS Centre Research Fellow, Coordinator, HADR Programme, Mr Remy Mahzam, Associate Research Fellow, ICPVTR, and Mr Zin Bo Htet, Research Analyst, HADR Programme and discussed about the HADR programme at RSIS, Islamic Relief’s development programmes and humanitarian relief around the globe. 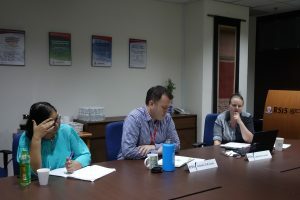 Professor Oliver Richmond and Dr. Sandra Pogoda of the Humanitarian and Conflict Response Institute in the University of Manchester conducted a fieldwork seminar for all NTS Centre Staff. Dr. Pogoda taught Centre staff on the structuring of interviews and the sensitivities that need to be considered in conducting them. 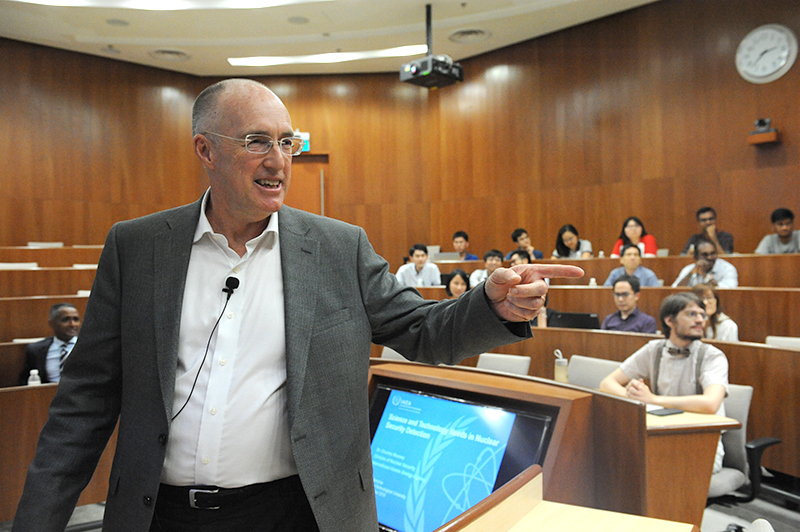 Professor Richmond spoke accordingly about qualitative research techniques, methods of interviewing and one’s embeddedness in his or her own research. He significantly pointed out the knowing one’s positionality throughout the research process is essential to maintaining the credibility of research outcomes. On 16 November 2015, the Singapore Civil Defence Force ASEAN Senior Executive Programme on Leadership in Disaster Management commenced. This programme is designed to address the importance of effective leadership on disaster management at strategic and policy levels, focusing on preparedness and response phase of the disaster management cycle. It will provide a wide-ranging discourse on issues and challenges facing emergency authorities in disaster management at national level. Dr Alistair Cook, HADR Programme Coordinator, shared with participants on the topic ‘Future HADR Landscape in Asia’ as part of the training programme. Globalization has led to a surge in crossborder migration, and the population of international migrants in East Asia has more than doubled over the past two decades. Today, governments in the region are grappling with these expanding and increasingly complex flows of people as well as the human security challenges that they bring, but as a result, they too often overlook the potential opportunities that accompany skillfully managed migration. 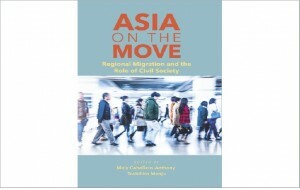 In this volume, experts from “sending” and “receiving” countries in Asia outline current trends in China, Japan, Korea, and Southeast Asia; analyze existing government efforts to manage migration; and explore the unique role that NGOs can play in helping to protect migrants and to harness migration to the benefit of the region. For more information, please click here. 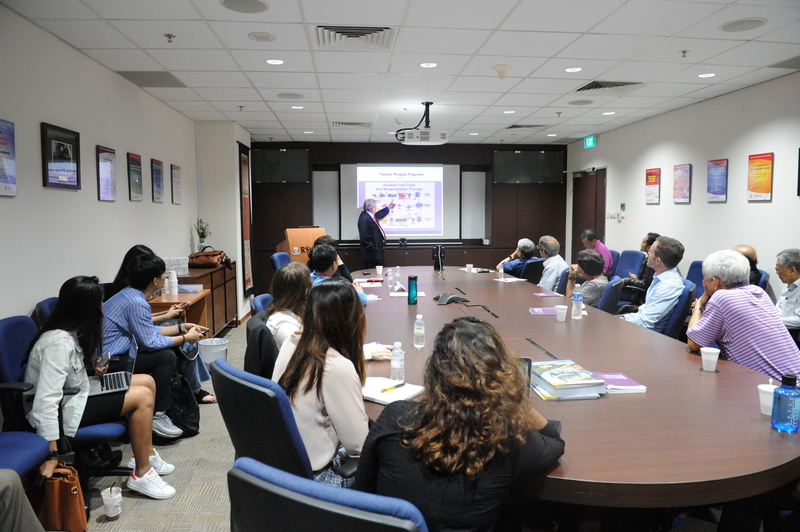 Lady Barbara Judge CBE, Chairman Emeritus of the UK Atomic Energy Authority, visited RSIS on 27 October 2015. During her visit, Lady Judge met with Ambassador Ong Keng Yong, RSIS Executive Deputy Chairman, Assoc Prof Mely Anthony, Head of RSIS NTS Centre, and Dr Alistair Cook, NTS Centre Research Fellow, to discuss the School’s research on nuclear energy and its governance in the region. Lady Judge also shared some of her own experience and views on the nuclear energy issue after being directly involved in the field for over a decade. Assoc Prof Mely Anthony, Dr Alistair Cook and Mr Julius Cesar Trajano attended the 3rd Meeting of the Council for Security Cooperation in the Asia-Pacific (CSCAP) Energy Security Study Group held at Copthorne King’s Hotel in Singapore from 26 to 27 October 2015. Co-chaired by Mr Kwa Chong Guan, the Meeting successfully conducted a scenario planning exercise in collaboration with the Risk Assessment and Horizon Scanning Office (RAHS)- National Security Coordination Secretariat (NSCS). The scenario planning exercise generated two coherent scenarios for the Asia-Pacific’s energy security by 2025. 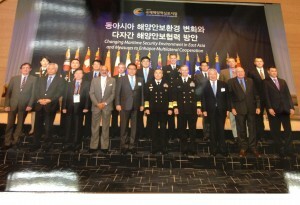 The 12th International Seapower Symposium was held on the 18th – 19th October in Busan, Republic of Korea. 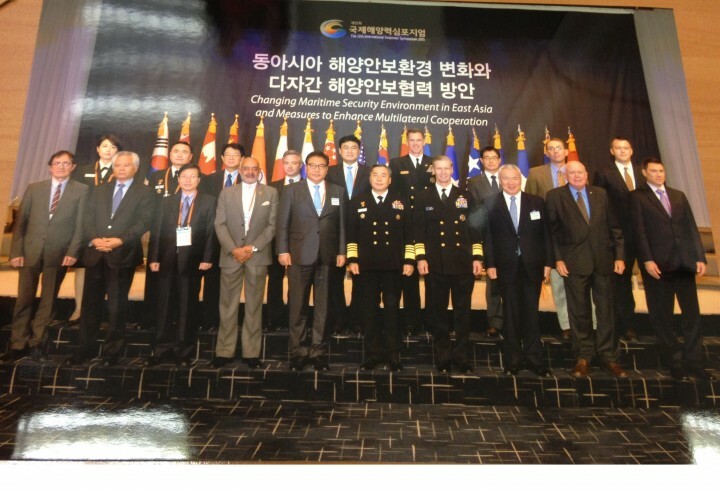 The Symposium was hosted by the ROK Navy on ‘Changing Maritime Security Environment in East Asia and Measures to Enhance Multilateral Cooperation” and celebrated the 70th anniversary of the founding of the ROK Navy. 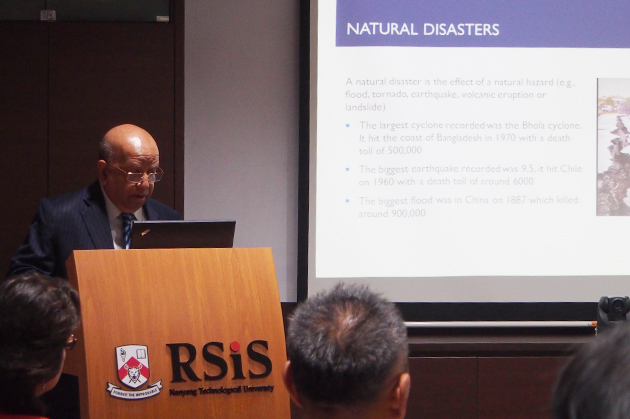 Dr Alistair D. B. Cook, Coordinator of the RSIS Humanitarian Assistance and Disaster Relief Programme and Research Fellow, NTS Centre presented on the prospects for cooperation on humanitarian assistance and disaster relief among navies in the region. 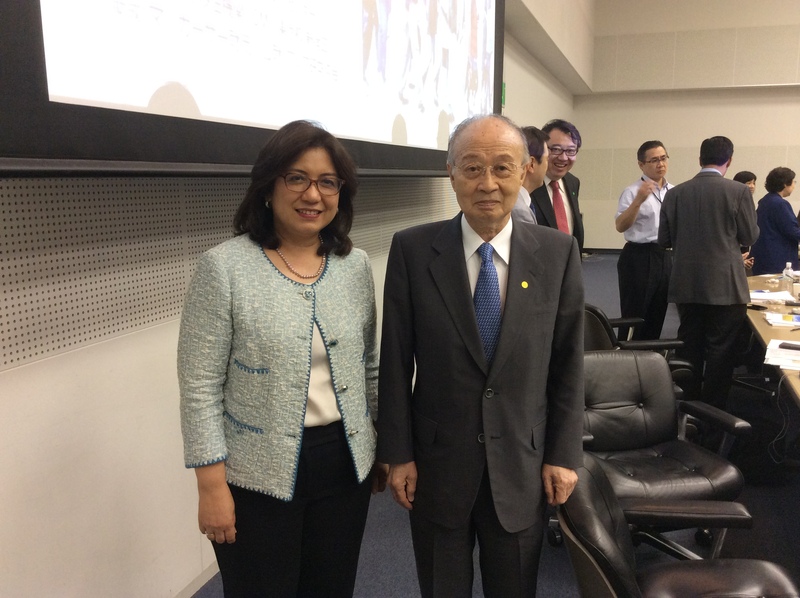 He noted that the multi-stakeholder humanitarian environment in East Asia means that cooperation needs to go beyond traditional methods of cooperation and look towards cross-sector collaboration drawing on the strengths of stakeholders. He further highlighted the need for a strategy that work towards a whole-of-society approach that minimises duplication of effort from different government departments, NGOs and the private sector. Dr Sam Bateman, policy advisor for the RSIS Maritime Security Programme presented on the issues of trust and cooperation among navies in the region, and identified that multiple forums have been established which need greater cooperation and trust between them. Dr Sng Bee Bee, a trainer of Academic Writing Skills in RSIS and an Associate Lecturer in NIE and SIM University, delivered a seminar titled ‘Towards a Sustainable Recovery Through Education: The Role of Faith Based Organisations in Disaster Relief Work.’ The seminar was moderated by Dr. Alistair D. B. Cook, Humanitarian Assistance and Disaster Relief Programme Co-ordinator, and Research Fellow, NTS Centre. The seminar was held at RSIS Seminar Room 5. In her seminar, Dr. Sng discussed about the sustainable development work that Faith Based Organisations (FBOs) have done in disaster-struck areas, particularly in the areas of education and medical services and how FBOs have engaged with victims of disasters. She highlighted the important role that FBOs played in co-operating with local governments to provide capacity-building in relation to training doctors and teachers while disaster recovery efforts were underway. Dr. Sng also shared about her research and experiences in a Christian international FBO that responded during the Sichuan earthquake in China. Dr. Math Noortmann, Research Professor in Transnational Law & Non-State Actors from the Centre for Trust, Peace and Social Relations at Coventry University, UK delivered a seminar titled “Human Security, Transnational Law and Non-State Actors: Revisiting ‘Old Ideas’?” The seminar was moderated by Dr. Alistair D. B. Cook, Humanitarian Assistance and Disaster Relief Programme Coordinator, and Research Fellow, NTS Centre. The seminar was held at the RSIS Lecture Theatre, Student Wing. In his lecture, Dr. Noortmann, covered topics such as, but not limited to: the evolution of human security, human development, non-actors actors, and asymmetrical warfare. He also brought to front that human security does not necessarily equate into human development, and that there can and are academic and practical definitions for both subjects. 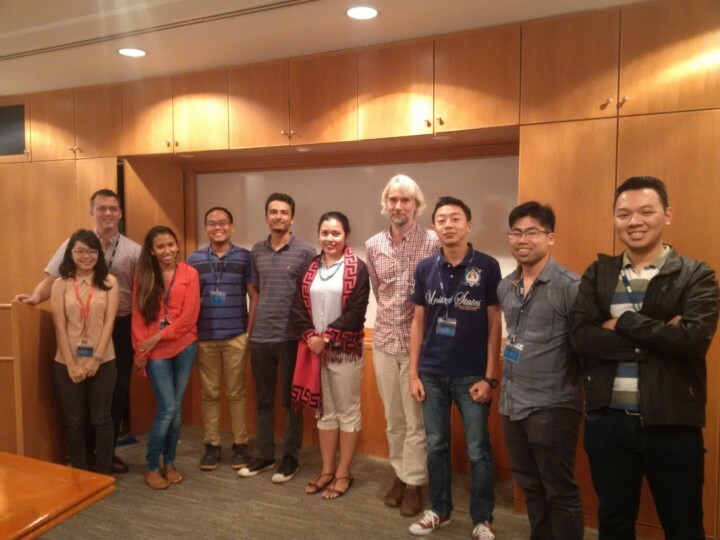 Dr. Alistair D. B. Cook, RSIS Research Fellow, Dr Serina Rahman, RSIS Research Fellow, and Mr Zin Bo Htet, RSIS Research Analyst, attended the Temasek Foundation Asia Journalism Forum on Reporting Migration held at the Park Royal Hotel in Singapore from 13-14 August 2015. The forum was organized by NTU’s Wee Kim Wee School of Communication and Information and the S. Rajaratnam School of International Studies, and the Hong Kong Baptist University’s School of Communication. The forum covered topics such as but not limited to: reporting on displaced persons, migration, the politics of immigration, and refugees. Dr Cook chaired the panel session on Human trafficking, slavery and refugees: The crisis of irregular migration. In this panel, Dr. Cook was accompanied by panelists from the University of Indonesia, the Mekong Club Hong Kong, NIE Singapore, and the Overseas Development Institute. 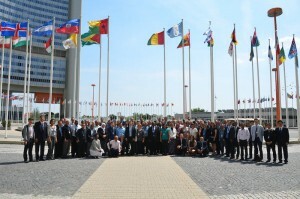 Mr Julius Cesar Trajano, RSIS Associate Research Fellow, attended the Fifth Annual Meeting of the International Nuclear Security Education Network (INSEN) at the IAEA Headquarters in Vienna, Austria from 10-12 August 2015. A total of 120 participants from around 70 member-institutions attended the meeting. 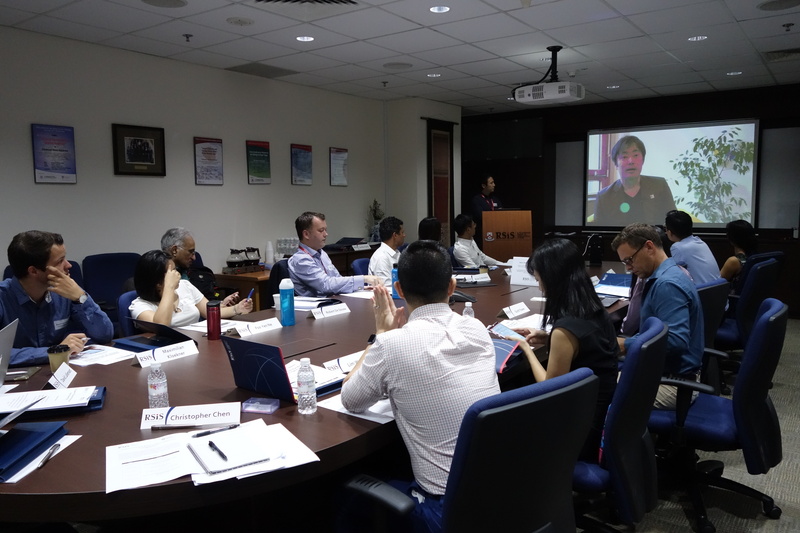 The mission of INSEN is to enhance global nuclear security by developing, sharing and promoting excellence in nuclear security education through active collaboration among member-institutions. 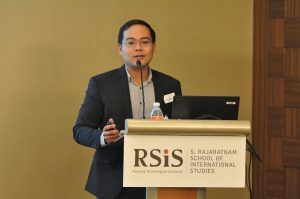 The chair of one of the working groups cited the contribution of RSIS to the network through its publications related to nuclear energy governance that are regularly shared with fellow members through the INSEN’s online portal. The meeting deliberated on collaboration among educational institutions on nuclear security education. It highlighted that research and professional development workshops on nuclear security by member-institutions are crucial in enhancing the local capacity of each member-state in upholding nuclear security as well as passing the knowledge on to the next generation of trainers, academics, students, regulators, front line officers, and other stakeholders in nuclear security. Assoc Prof Mely Caballero-Anthony with the members of the UN Secretary General’s Advisory Board on Disarmament Matters (ABDM). 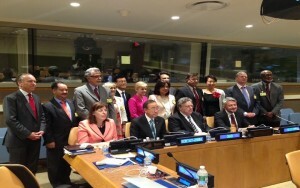 The 64th Session of the ABDM was held at the UN Headquarters, New York City on 29 June – 1 July 2015. Mr Kwa Chong Guan, RSIS Senior Fellow and Co-Chair of Council for Security Cooperation in the Asia-Pacific (CSCAP)– Singapore, Dr Alistair Cook, RSIS Research Fellow, Dr Youngho Chang, NTU Assistant Professor, and Mr Julius Cesar Trajano, RSIS Senior Analyst, attended the 2nd Meeting of the CSCAP Study Group on Energy Security in Beijing, China from 14 to 16 June 2015. Co-chaired by CSCAP Singapore, CSCAP China and CSCAP Canada, the 2nd meeting was hosted by China Institute of International Studies (CIIS) and discussed key strategic issues on energy security in the Asia-Pacific and their policy implications for the region. NTS Centre Head with Dr Yasushi Akashi, Chairman, International House Japan and former Under Secretary-General of the United Nations. NTS Centre Head Assoc. 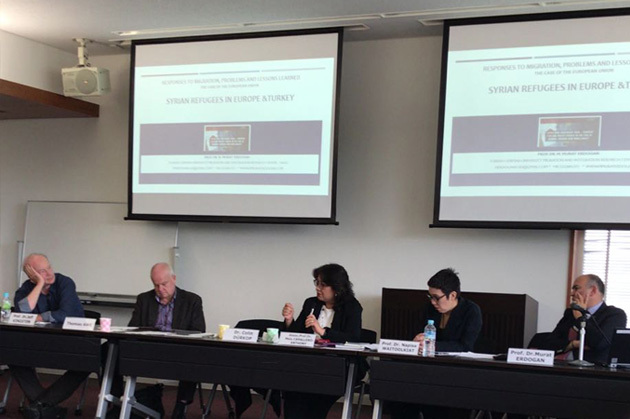 Prof Mely Caballero Anthony chaired the session on, ‘Asia on the Move: Search for Human Security-focused System, in International Workshop on ‘Asia on the Move: Regional Challenges’, held at the United Nations University, Tokyo, Japan on 1 June 2015. The Workshop was jointly organised by the Japan Centre for International Exchange, the United Nations University in cooperation with the International Migration Organization and the Tokyo Metropolitan Government. The WHS Global Forum seeks to develop recommendations to improve the effectiveness and efficiency of civil-military coordination in disaster relief responses at the national, regional and international levels. More than 100 policy makers and operational experts from UN agencies, regional organisations and non-governmental organisations (NGOs), as well as defence establishments and national disaster MANAGEMENT authorities from more than 25 countries are attending the three-day forum. 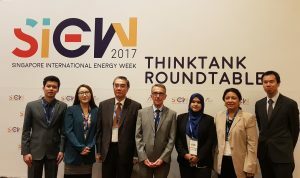 The Energy Market Authority officially launched the Singapore International Energy Week (SIEW) 2015 with the theme “Global Energy Transition” on 30 March 2015. 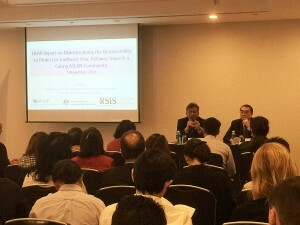 RSIS will be hosting a roundtable on nuclear safety, security and safeguards in the Asia-Pacific. 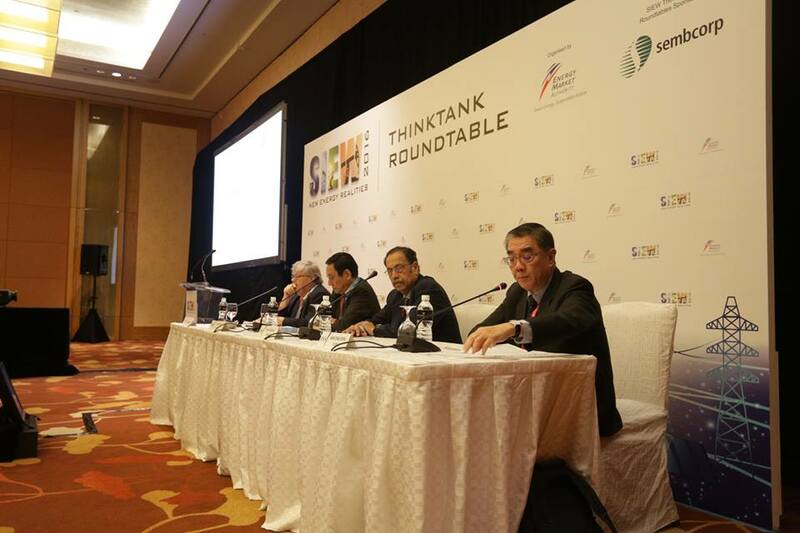 SIEW 2015 will be held at the Marina Bay Sands Expo and Convention Centre on 26-30 October 2015. Associate Professor Mely Caballero-Anthony participated in the Sixth Annual Asian Relations Conference (ARC VI) as a panelist on Session I on “Non Traditional Themes: The Evolving Concept.” Organised by the Indian Council of World Affairs (ICWA), India’s oldest and premier foreign policy think-tank, the ARC VI deliberated on “Non-traditional Themes in Asian Foreign Policies.” It was held on 23-24 March 2015 in New Delhi. Associate Professor Mely Caballero-Anthony has been elected as an at-large representative to the International Studies Association Governing Council for 2016 – 2017. Click here for more information. 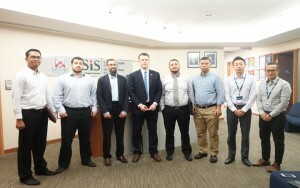 Dr. Alistair Cook presented at an Asan Roundtable on Research Trends in Southeast Asian Non-Traditional Security at the Asan Institute for Policy Studies in Seoul, Republic of Korea on Friday, 14th November 2014. 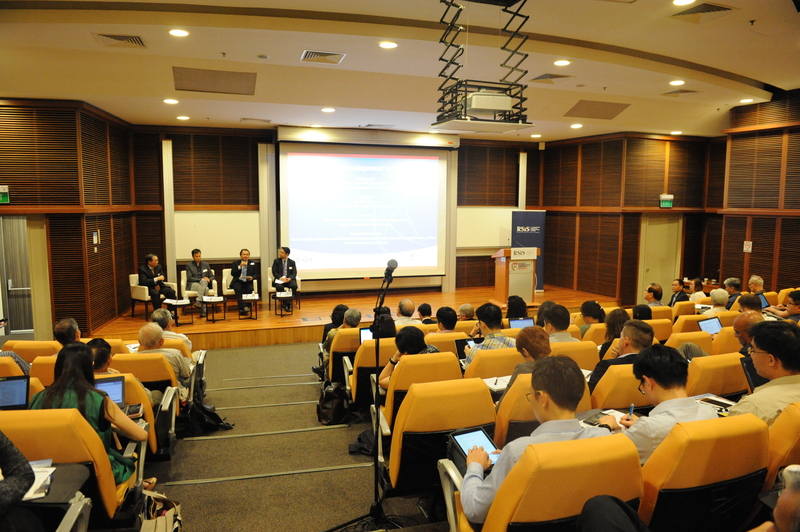 NTS RSIS team attended the author’s workshop on ‘Managing Movements of People for Security and Prosperity in East Asia: Roles of Civil Society’, organised by the Japan Center for International Exchange (JCIE), Japan in collaboration with the NTS Centre, 13 October 2014, RELC, Singapore. 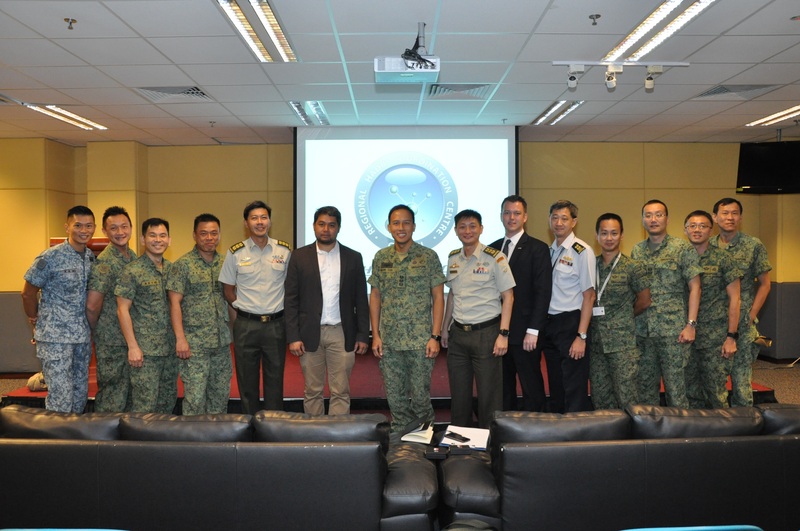 Dr. Alistair Cook attended the official launch of the Changi Regional HADR Coordination Centre (RHCC) at the Changi Command and Control Centre located within the Republic of Singapore Navy’s Changi Naval Base on 12 September 2014. The Changi Regional HADR Coordination Centre (RHCC) aims to focus on supporting a disaster affected state’s military in coordinating assistance provided by foreign militaries as well as support and complement other existing mechanisms such as the ASEAN Coordinating Centre for Humanitarian Assistance on disaster management (AHA Centre) and UN Office for the Coordination of Humanitarian Affairs (OCHA). For more information on the Changi RHCC, please click here. Associate Professor Mely Caballero-Anthony attended the inaugural launch of the Report of the High Level Advisory Panel on Responsibility to Protect (RtoP) in Southeast Asia in the headquarters of the UN in New York on 9 September 2014. Click here for more information.